Today’s guest picture comes from my Newcastle correspondent’s trip to the west coast of the USA. 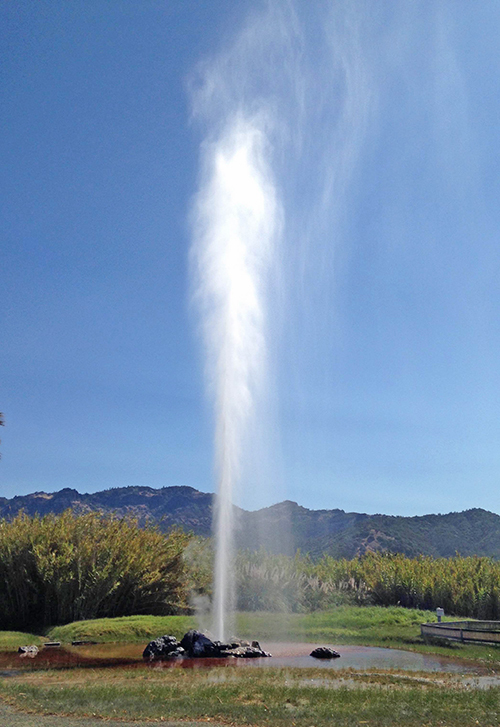 It shows ‘Old Faithful’, which she tells me is one of only three regularly erupting geysers in the world. 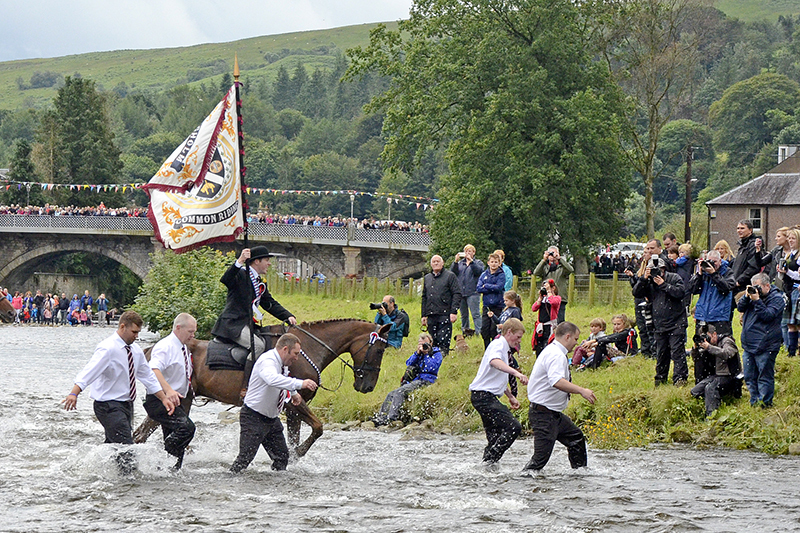 It was Langholm Common Riding today and it was my firm intention to rise at 5 am. This is the time when the flute band perambulates the town to wake up the citizens and remind them that there is a hound trail on the hill at 6.30. My plan was to take wonderful pictures of both the band and the hounds. The flute band duly perambulated and I duly got up and put my clothes on. Then I heard the rain hammering on the windows and looked out to see the hill swathed in low cloud. Wonderful pictures were off the menu. I took my clothes off again and retired to bed. I had a second and more successful go at getting up and although it was still raining, Mrs Tootlepedal and I went out to wait for the Cornet and his mounted followers to come down Thomas Telford Road, the first part of their visits to the far flung corners of the town during the morning. 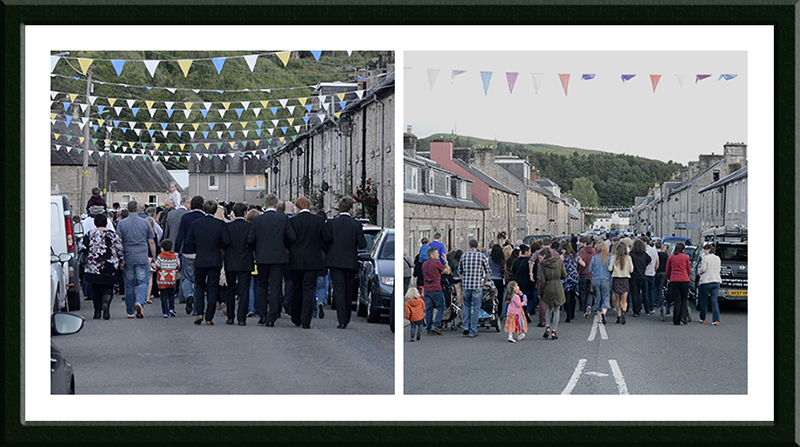 The procession is led by group of men organised by new neighbour Hector, whose job it is to carry the first of the emblems of the Common Rising, a barley banna and a saut herring. They are the ones braving the rain in their shirtsleeves. 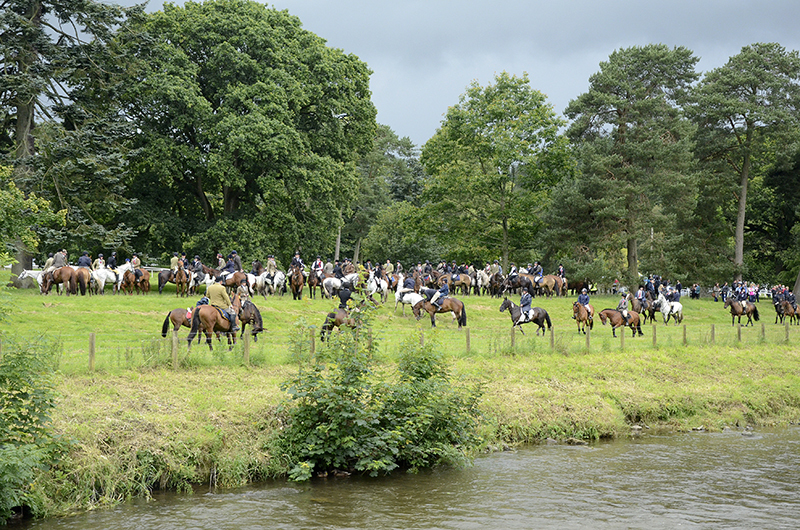 The mounted procession circles the Buccleuch Centre and the historic pump beside it…. 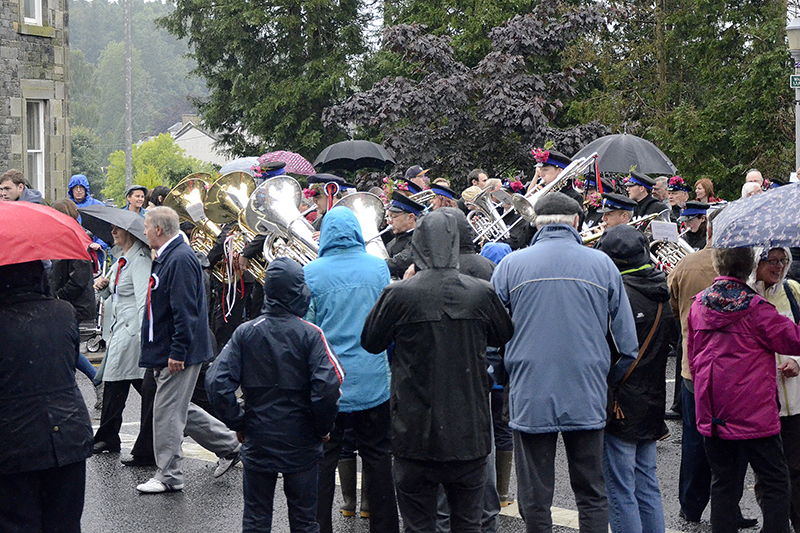 …and then led by the emblem bearers and the Town Band, makes its way back up Thomas Telford Road…. 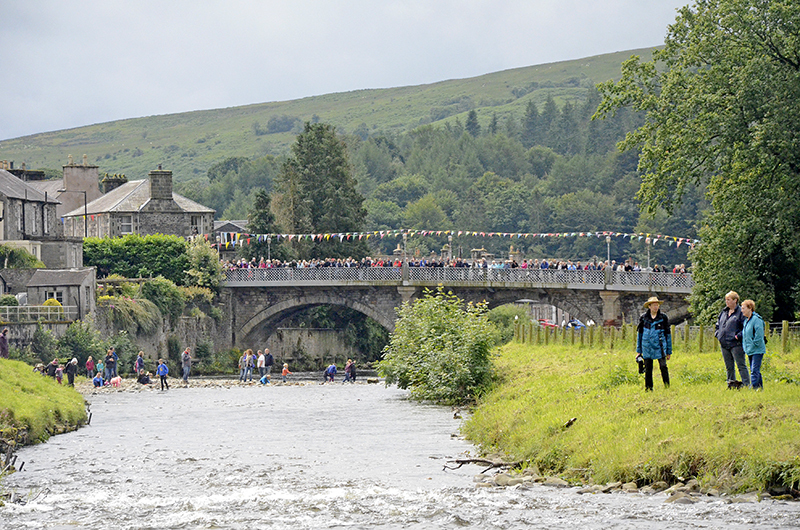 …and across the Langholm Brig…. 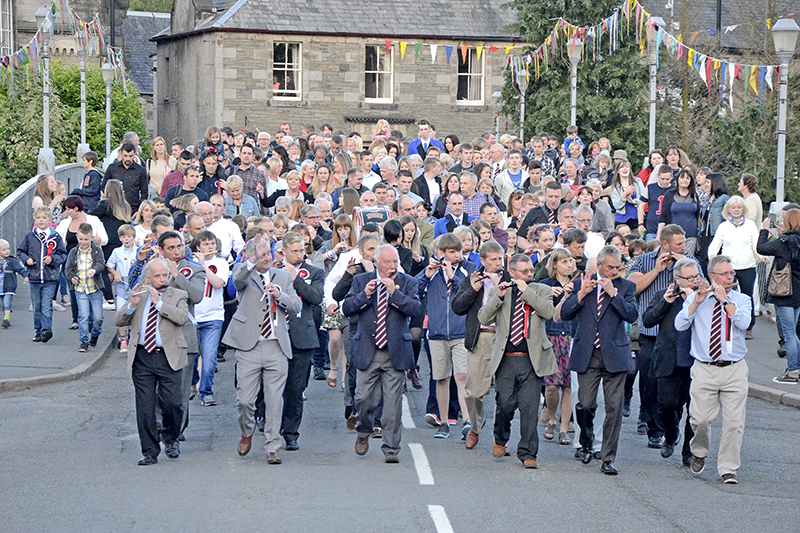 The High Street is lined with crowds of spectators, several rows deep. …and then it disappears along the High Street to Townfoot. 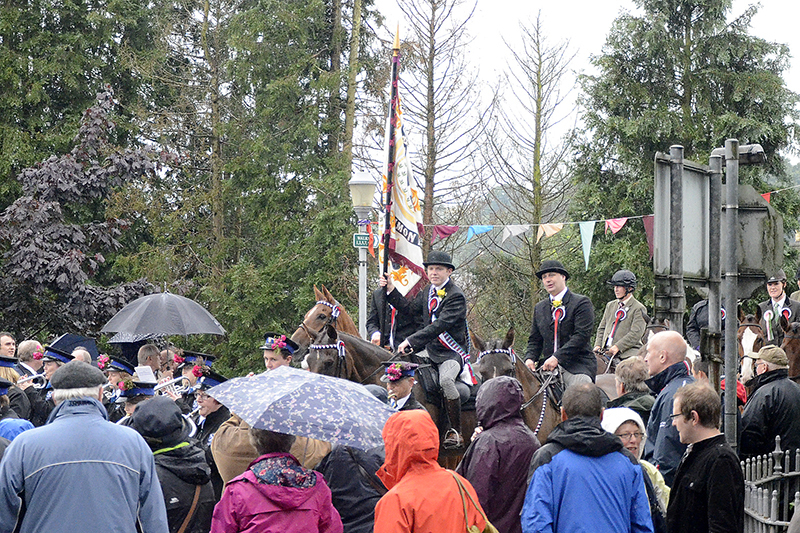 Mrs Tootlepedal counted over a hundred and thirty riders in the cavalcade and this makes for many delays. A horse with some natty headgear waits patiently for the procession to resume. We left them to it and walked up to the top of the Kirk Wynd. 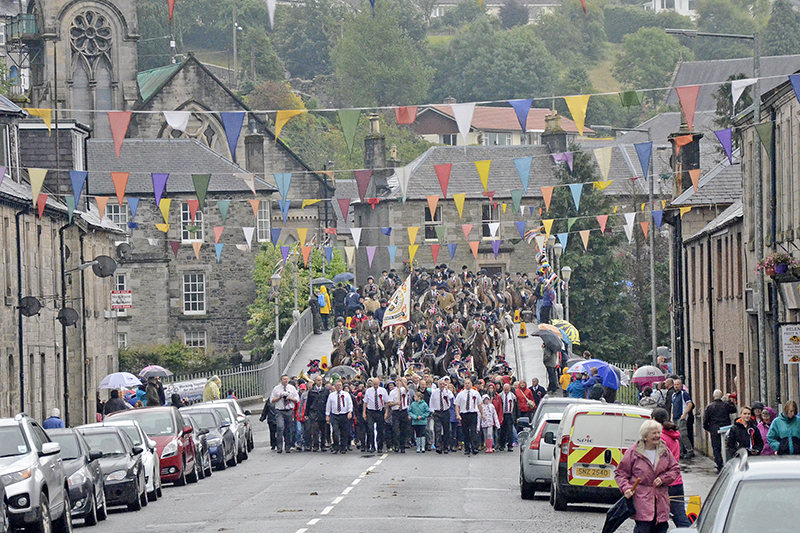 After the first ‘crying of the fair’, the cornet and his mounted followers gallop up the steep Kirk Wynd out of the Market Place surrounded by cheering crowds and Mrs Tootlepedal likes to see this part of the proceedings. 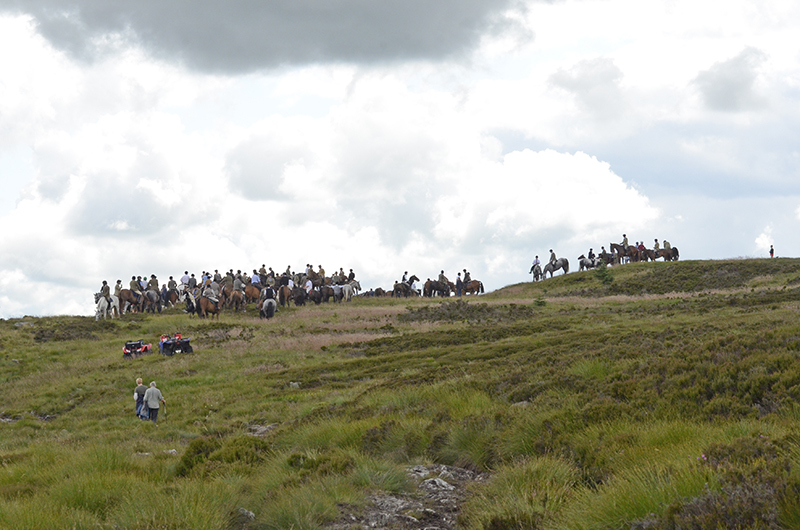 I walked a little further up the hill in pursuit of pictures which didn’t include the heads of a hundred people waving mobile phones in the air between me and the cornet. 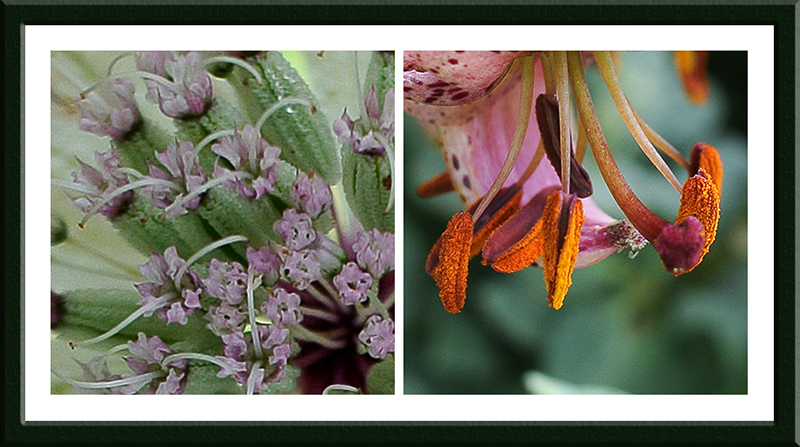 I admired these fine rosebay willow herbs as I waited for the cornet to arrive. The cheers from the crowd below told me that he was coming. Jamie Fletcher, the cornet, passed us in very good style and he was pursued by his 130 followers at a more leisurely pace. 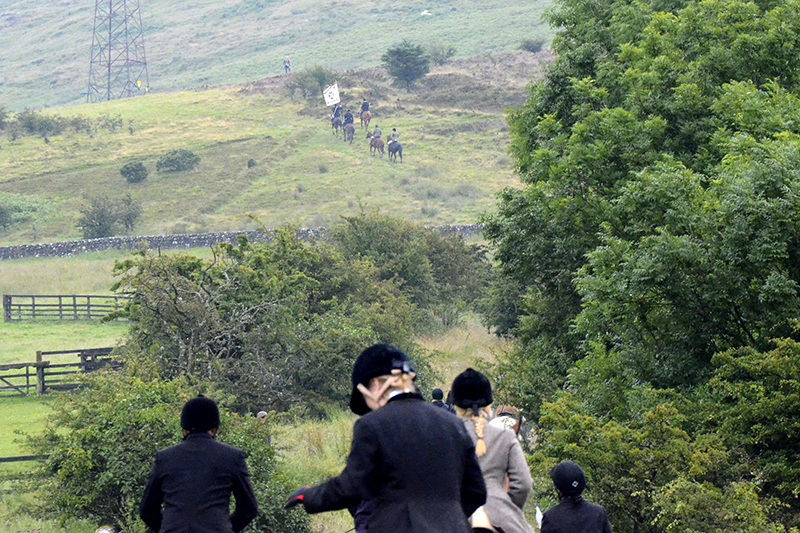 The procession was still passing me as the cornet arrived on the hill. By the time the procession had passed me, the rain had just about stopped and by the time that I had met with Mrs Tootlepedal and we had gone home for a cup of coffee, it was bidding to be a slightly better day. We left the house after our coffee and walked up to the Market Place for the second ‘crying of the fair’. 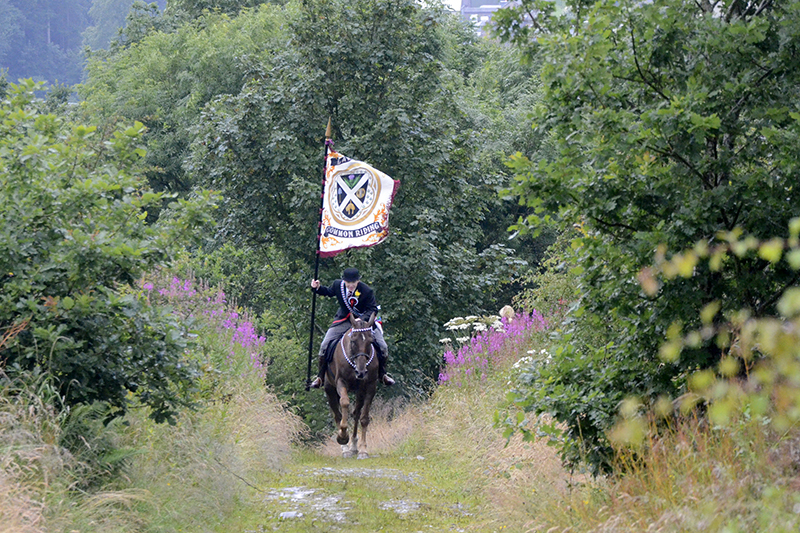 The procession is now preceded by three more emblems which are carried aloft, the spade, the crown and the thistle. 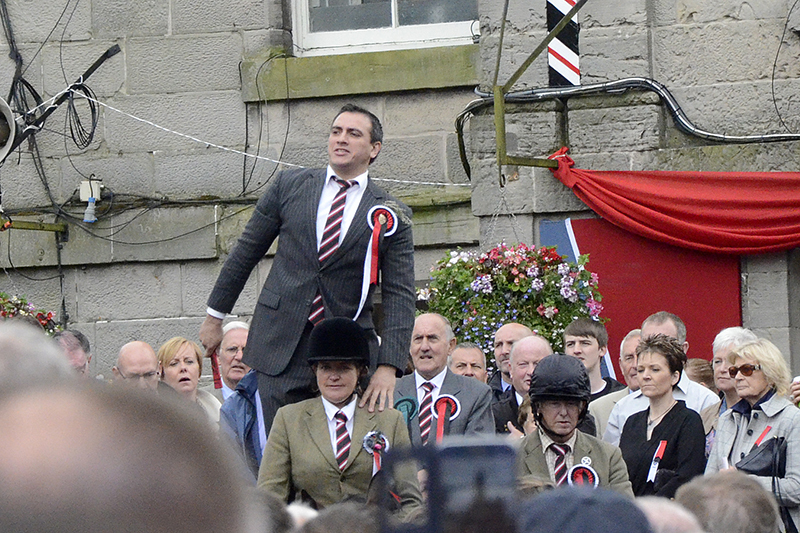 Rae, the fair crier stands on the back of a parked horse to address the crowd. He does this in stentorian tones without the aid of any amplification. 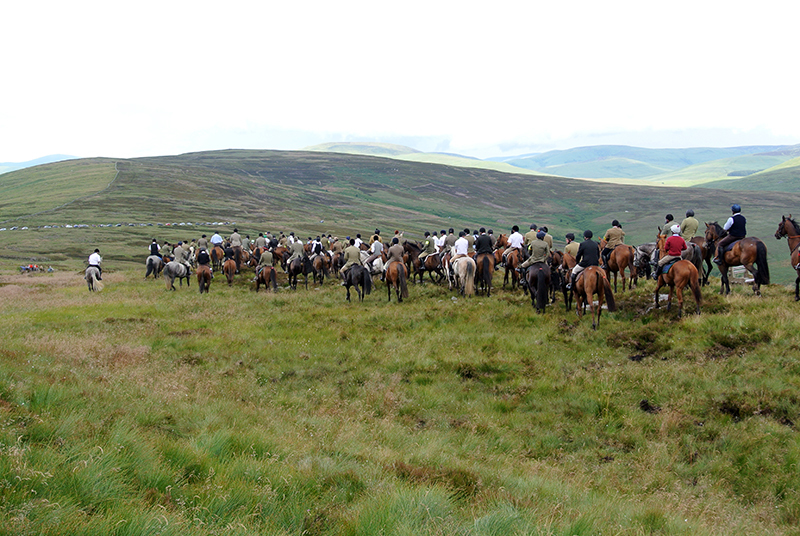 This Is To Give Notice that there is a muckle Fair to be hadden in the muckle Toun o’ the Langholm on the 15th day of July, auld style, upon his Grace the Duke of Buccleuch’s Merk Lands, for the space of eight days and upwards; and a’ land-loupers, and dub-scoupers, and gae-by-the-gate swingers, that come to breed hurdums or durdums, huliments or buliments, hagglements or bragglements, or to molest this public Fair, they shall be ta’en by order of the Bailey and Toun Cooncil, and their lugs be nailed to the tron wi’ a twalpenny nail, and they shall sit doun on their bare knees and pray seven times for the King and thrice for the Muckle Laird o’ Ralton, and pay a groat tae me, Jamie Ferguson, Baillie o’ the aforesaid Manor, and I’ll away hame and hae a Bannock and a saut herring tae ma denner by way o’ auld style. 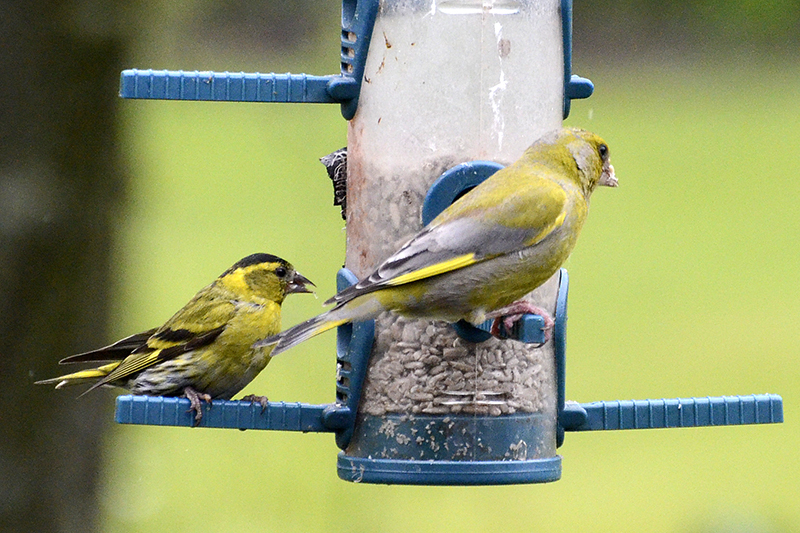 …were filling up with interested spectators too. 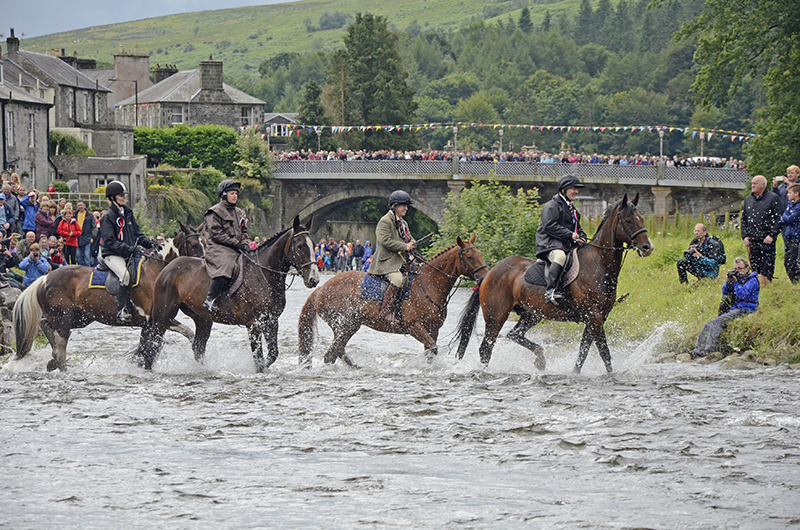 The cornet and the spade carriers led the way across the Ewes water and onto the Castleholm. 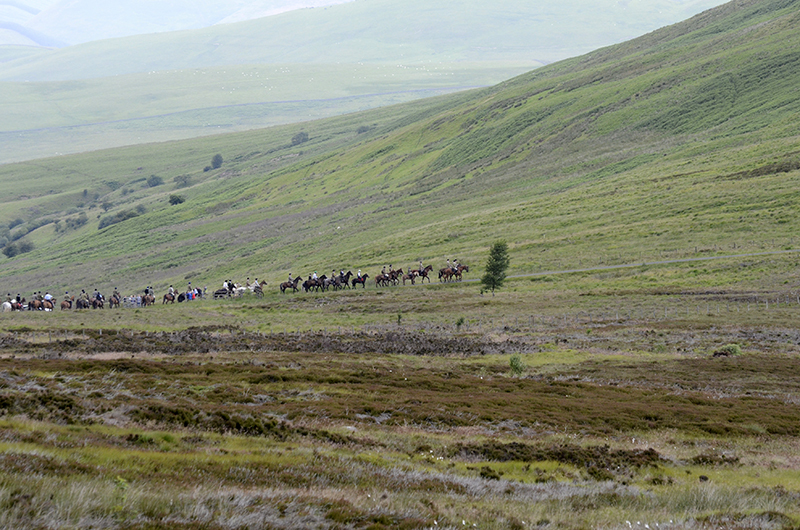 …followed by the rest of the riders. 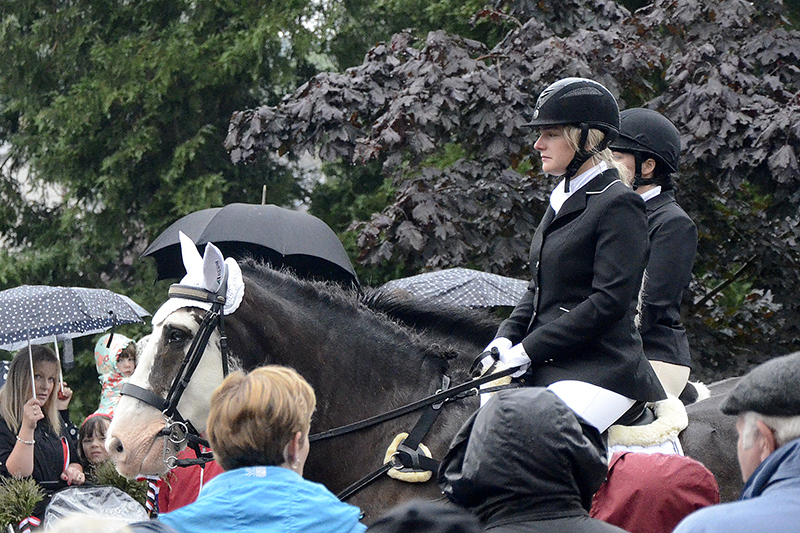 …and the cornet was led out to start the Cornets Chase. 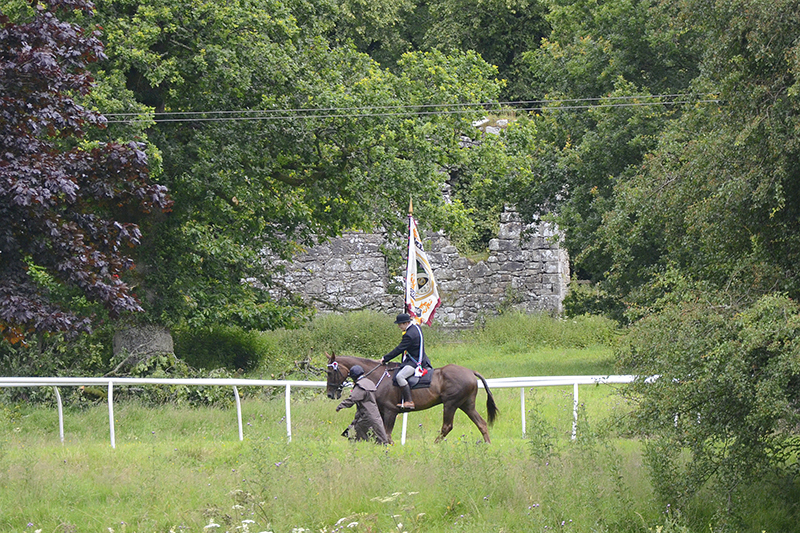 Passing in front of the ruins of Langholm castle which give the Castleholm its name. 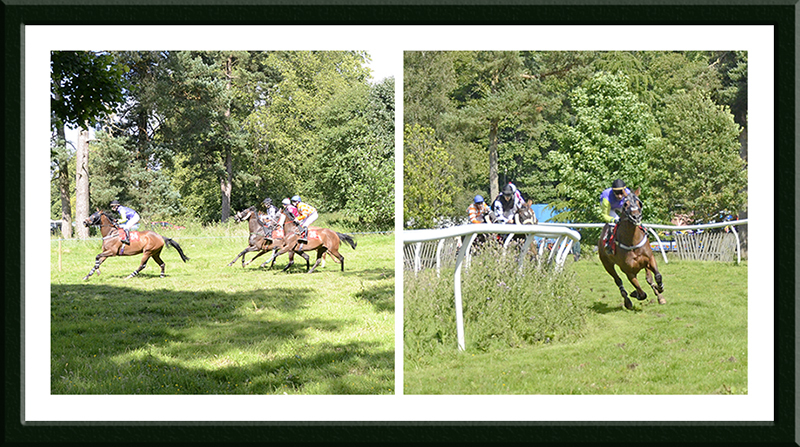 He is given a good start and then the rest of the riders chase after him. 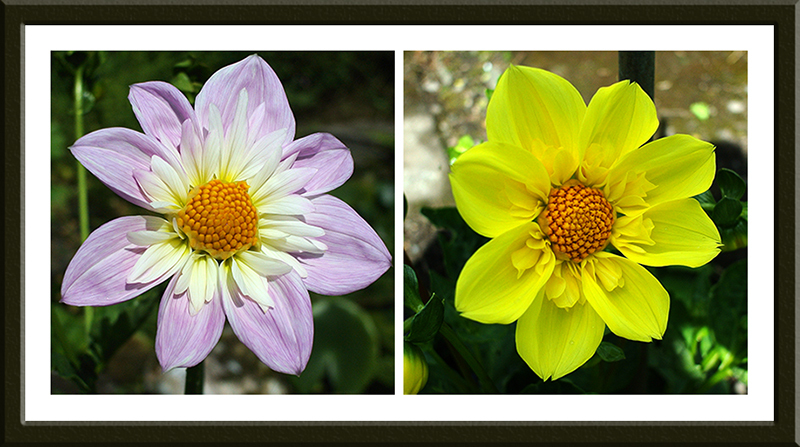 That concluded the morning’s work for us and we retired for our lunch….and an obligatory flower picture. In the afternoon the weather took a decided turn for the better and the sun came out. 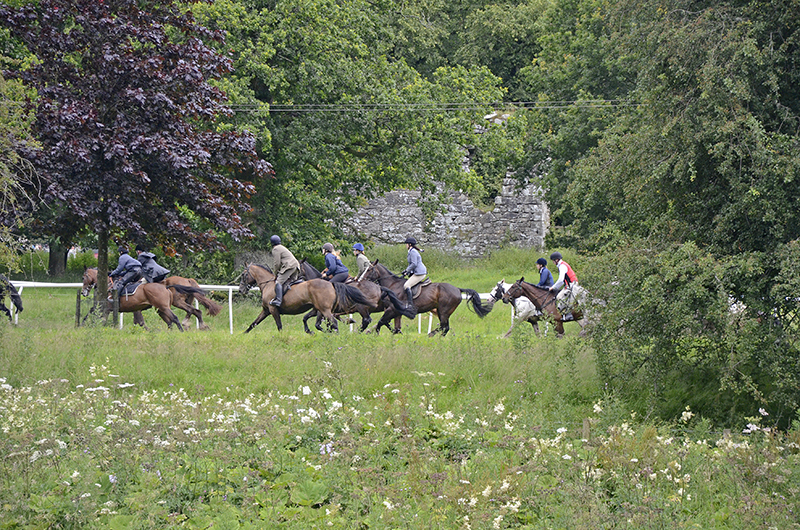 I walked back to the Castleholm to watch the foot and horse racing there. Mrs Tootlepedal stayed at home and did heroic gardening. 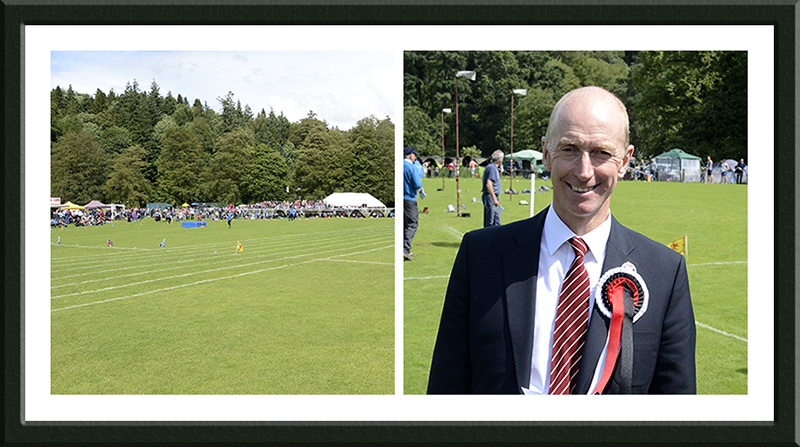 The athletics takes place on the cricket ground and it was looking very sunny when I got there…as was Roger, the chairman of the Common Riding committee whose heart must have sunk when he saw the early rain. 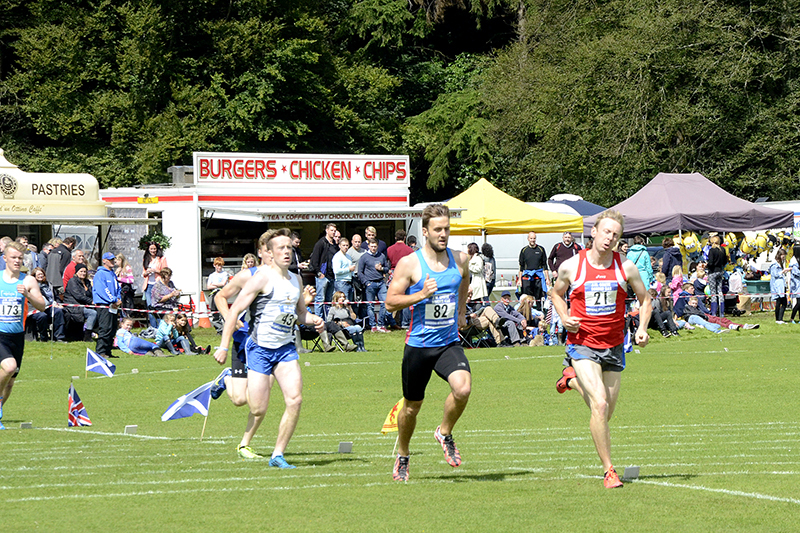 There are races over varying distances from 90 to 1600 metres. All the races are handicapped and open to males and females and there is wide variety of runners, the oldest today being over 70. 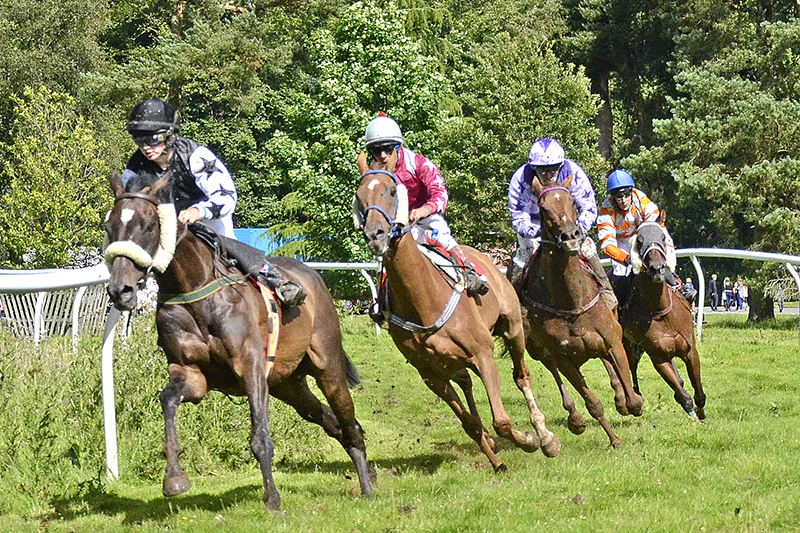 The going on the horse race track was very heavy after all the rain and entries were low as a result. It was a little drier at the bottom corner. 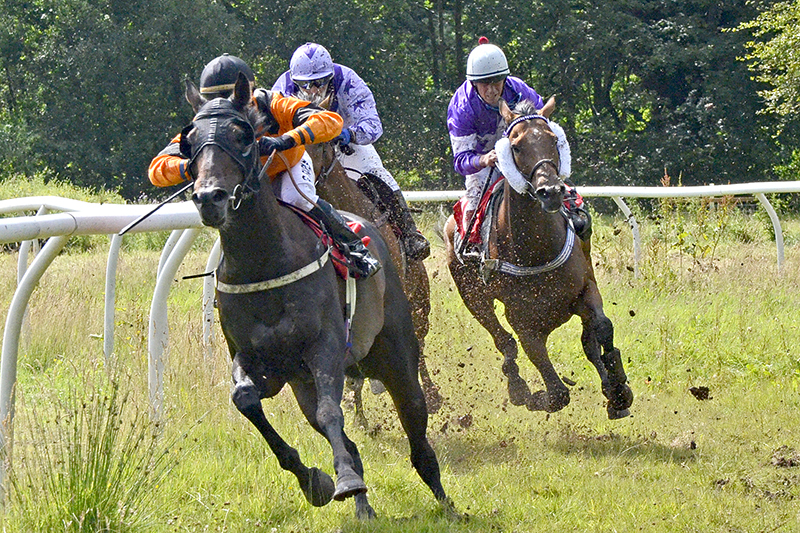 In the third race, a crafty jockey stole a march at the start of the race and was still leading handsomely when they came round the bottom corner. 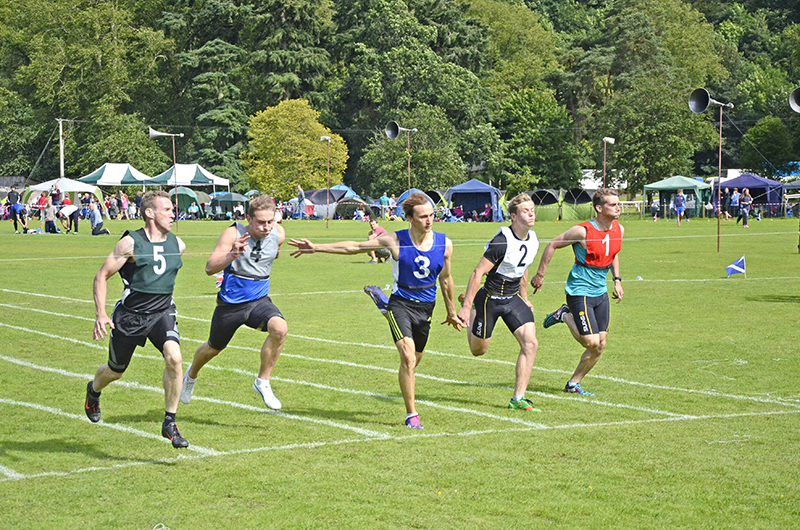 The rest of the field was playing catch up. 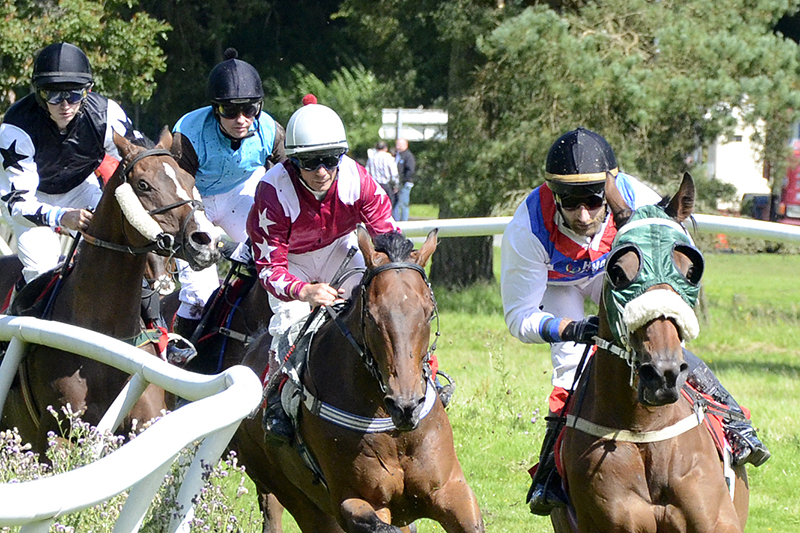 I expect that words might have been spoken if the runaway held his lead to the finish. I was able to look around between times and saw a nice fence post. I would like to have stayed to watch the Cumberland wrestling and the high jump but my legs had other ideas and took me home before I fell over. I apologise for going over the top with the number of pictures in this post but the Common Riding only happens once a year so I hope that readers will forgive me. I also note that if readers looked at the posts for the Common Riding for any of the past three or four years, they might find a remarkable similarity to this post. 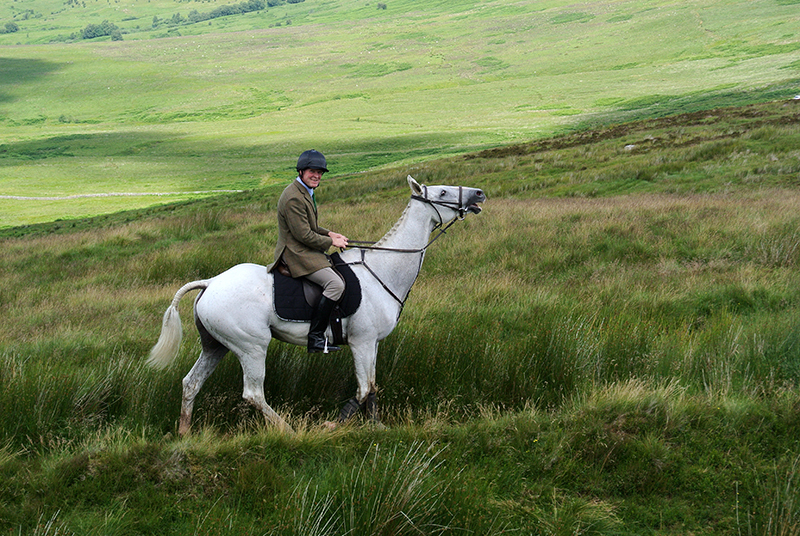 One of the charms of the Common Riding is that it follows a traditional course and hardly alters from year to year. We know what we like. 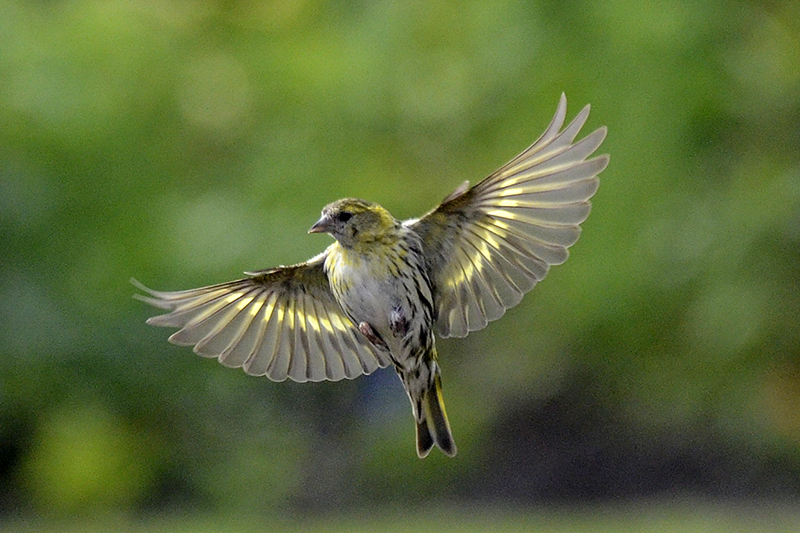 A flying siskin offers the day its blessing. 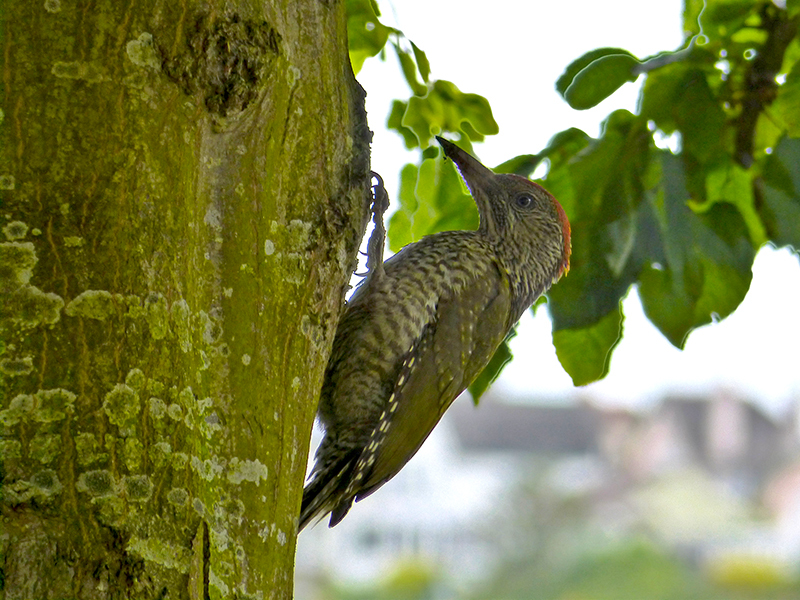 Today’s guest picture was sent to me by Venetia and shows a green woodpecker visiting a hornbeam in her garden. DShe says that it made a tremendous amount of noise. Mrs Tootlepedal spent the day visiting Matilda in Edinburgh while I made the most of a second sunny day at home. To make the day even better, there were no threatening clouds or passing showers. I was very good though and spent the first hour after breakfast putting a week of the newspaper index into the Archive Group database. This post finished off 1890 and it is always a great moment when another year is tucked away. Luckily Dropscone was on hand with freshly made scones to go with a cup of coffee (or two) when I had finished. Fortified by this, I went out on the fairly speedy bike to test my creaky knee. I did walk round the garden first though. 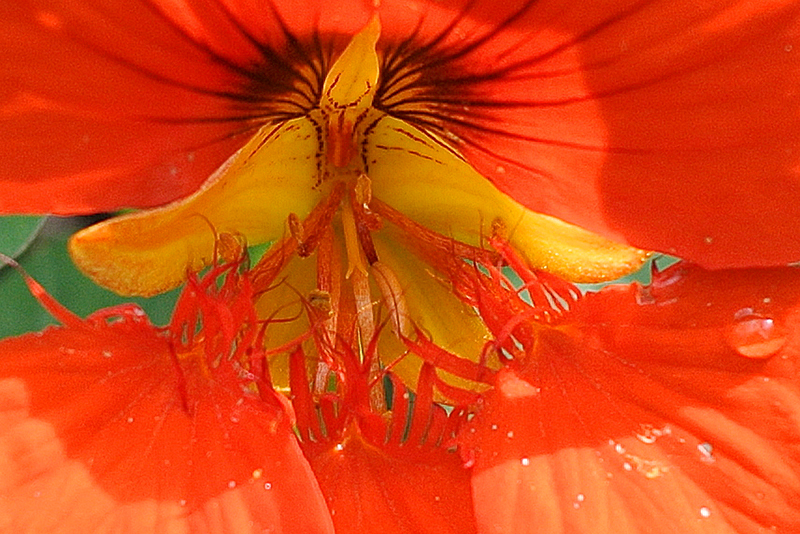 A nasturtium’s mouth looked like rather a dangerous place. 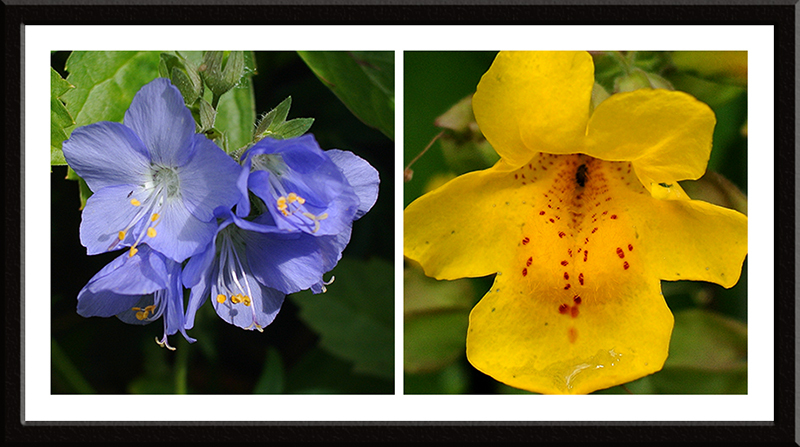 Two lasting old friends, polemonium and musk. I like the way that little footprints lead into the heart of the musk. I put the camera away and got started. It was a wonderful day for cycling…. …with light winds which were behind me on the exposed parts of the route and against me when I was in the sheltered sections. 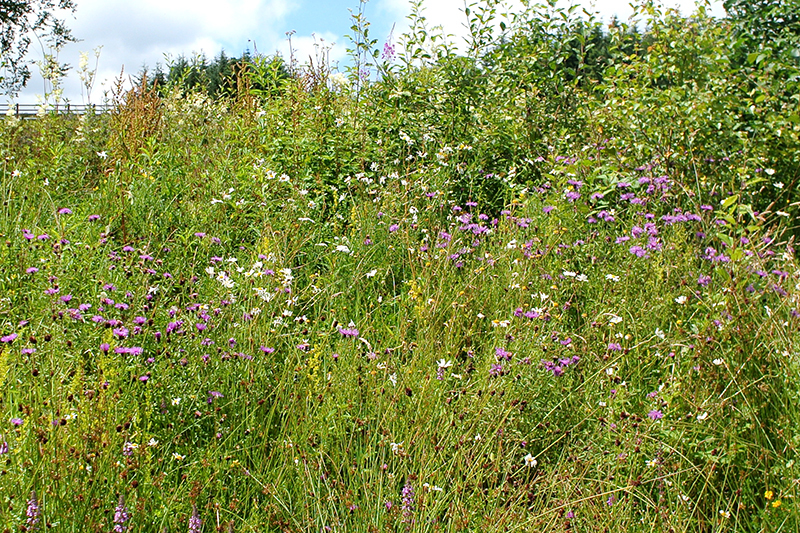 Sensibly I slowed down a bit as I got onto the gently uphill section back to Langholm and this gave me a moment to enjoy the wild flowers in the verges. I got home in very good order and after a light lunch, set about some garden tasks. I mowed lawns and I sieved compost and felt very virtuous. So virtuous in fact that I had to sit down in an easy chair to recover. Mrs Tootlepedal got back safely from Edinburgh, having had an enjoyable visit to Matilda. 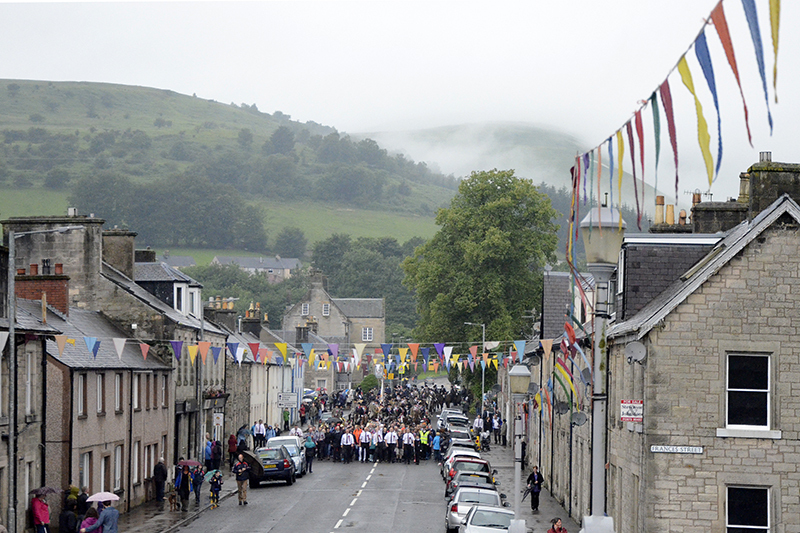 It was Summer Fair today in Langholm, the eve of our annual Common Riding and it is celebrated with music so after tea, Mrs Tootlepedal and I walked up to the High Street and joined the crowd in the Market Place who were listening to the Langholm Town Band playing a programme. After the band finished, we walked back home but I was soon out again to watch the Flute Band march round the town. The flute band meets the last train of the day into Langholm, greets returning emigrants and then leads them through the streets. 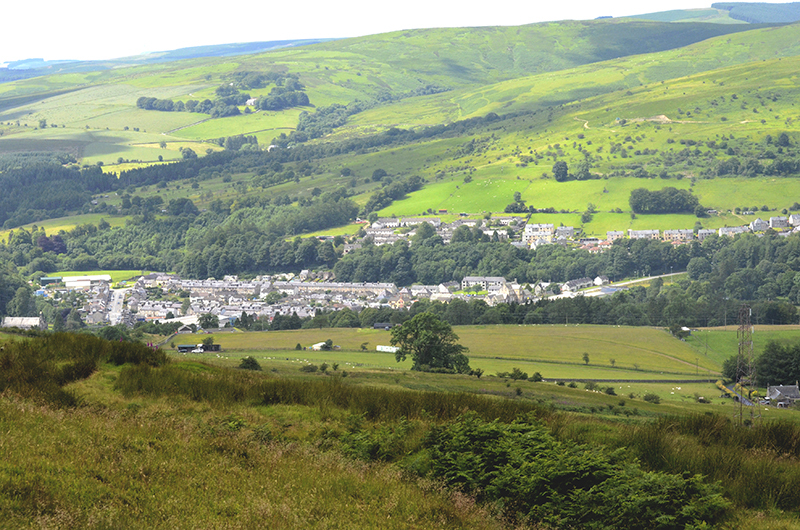 The fact that the last train arrived in Langholm nearly half a century ago doesn’t make any difference. They still go to meet it. 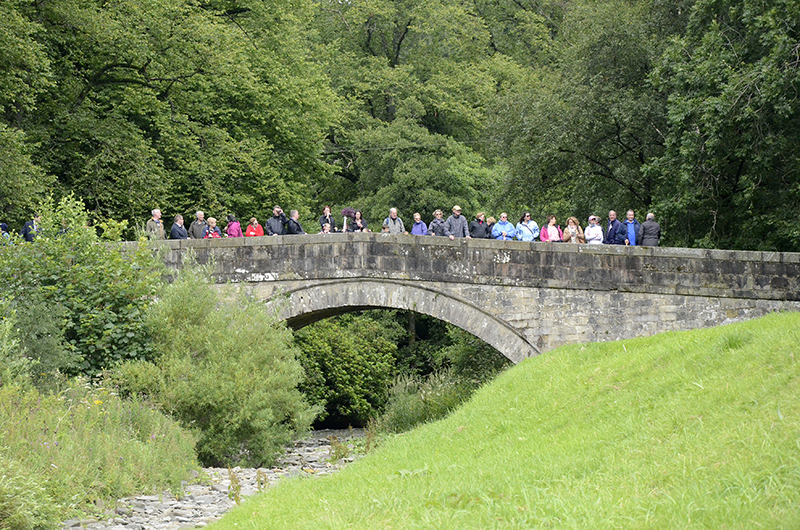 …and even more people following along behind it. 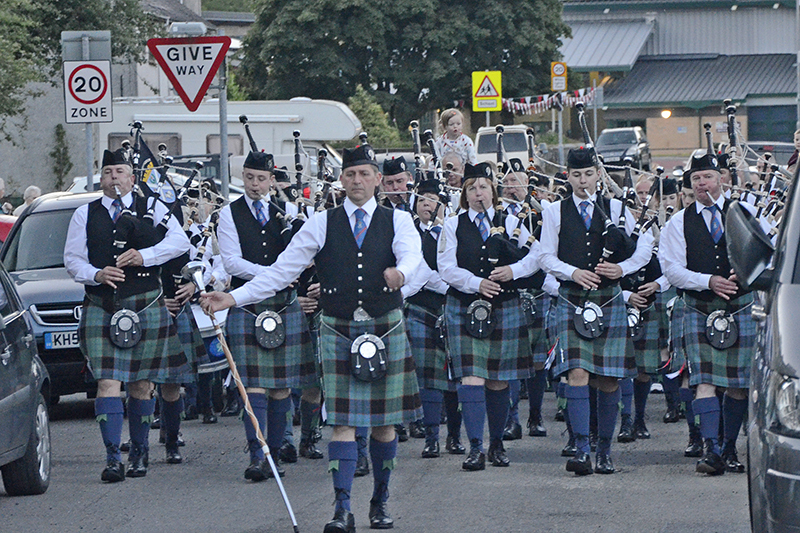 Shortly after the Flute band had passed by, the Langholm Pipe Band also marched through the streets of the New Town. They too have their followers…. 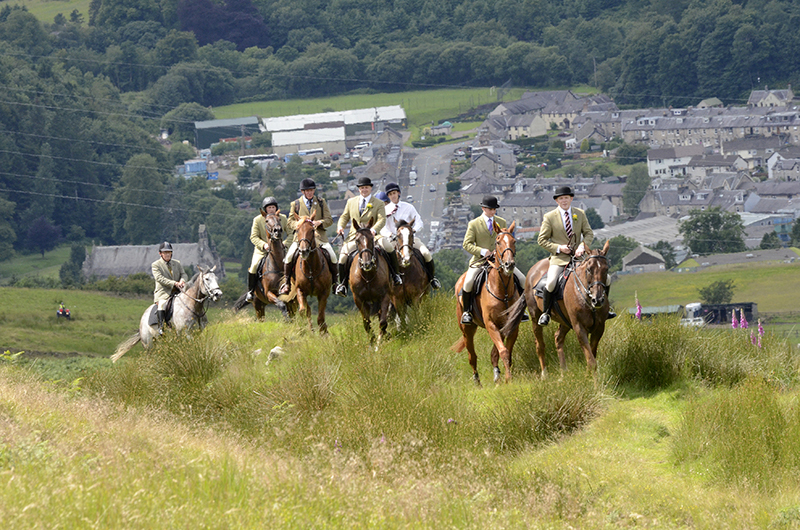 It is one of the best things about the Common Riding and its proceedings that the streets of the town, for short time at least, are reclaimed by its inhabitants from the grip of the motor car. 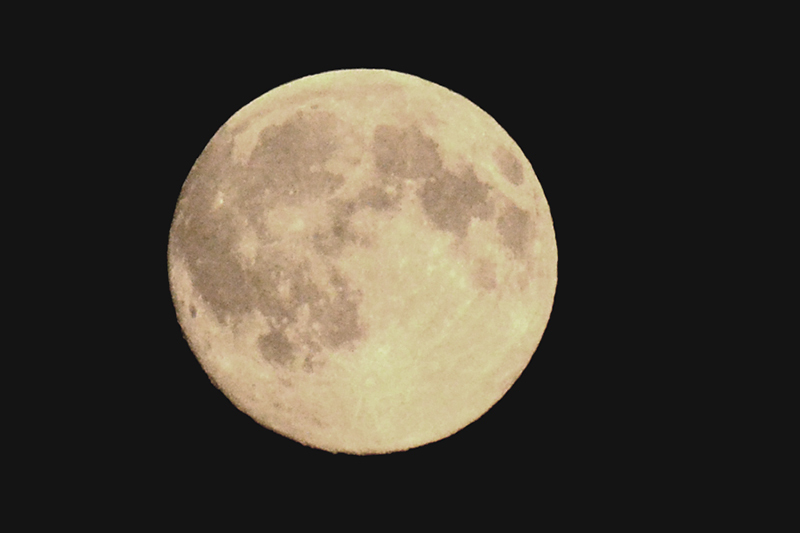 Although my camera makes it look as though it was still quite light, a full moon was looking down benignly from the sky above the town as the bands went by. The end of a very good day. It looks touch and go as to whether the weather will be as kind to us tomorrow. 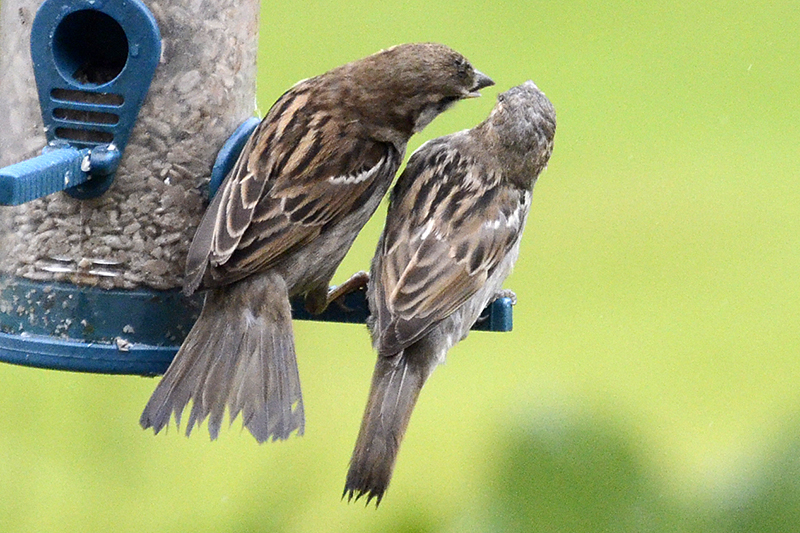 …even to the extent of sharing a perch. 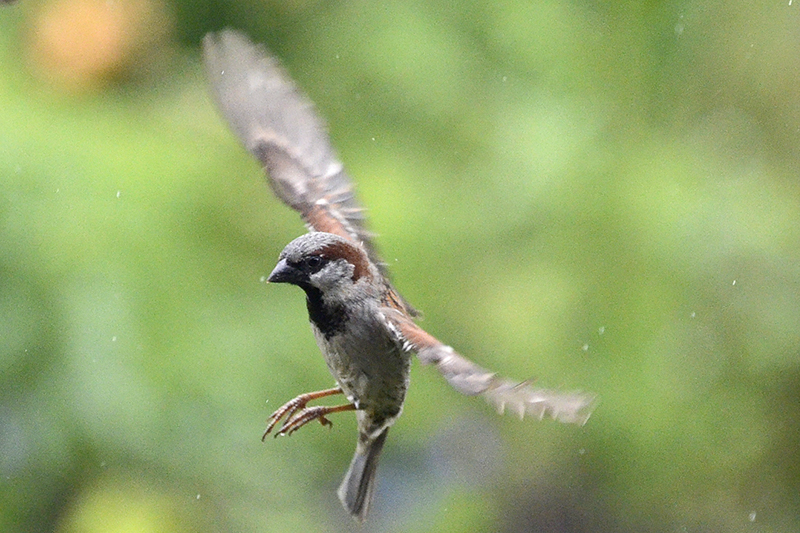 It will come as no surprise that the flying bird of the day is another sparrow (though I should have been able to get a better picture on such a sunny day). Today’s guest picture comes from my friend Liz, Mike Tinker’s daughter, who is on holiday with her family in the West Highlands. The picture shows the view from their holiday home window. 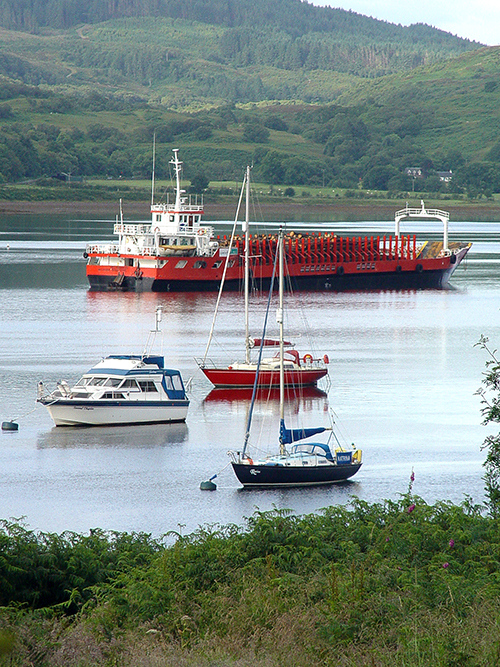 Close examination of the large red boat shows that it is loaded with cut timber and is the Highland equivalent of our log lorries, taking trees from local forests as they are felled. We got up to a sunny morning and although it was still on the cool side for July, just having the sun out made it feel warmer than it has been lately. 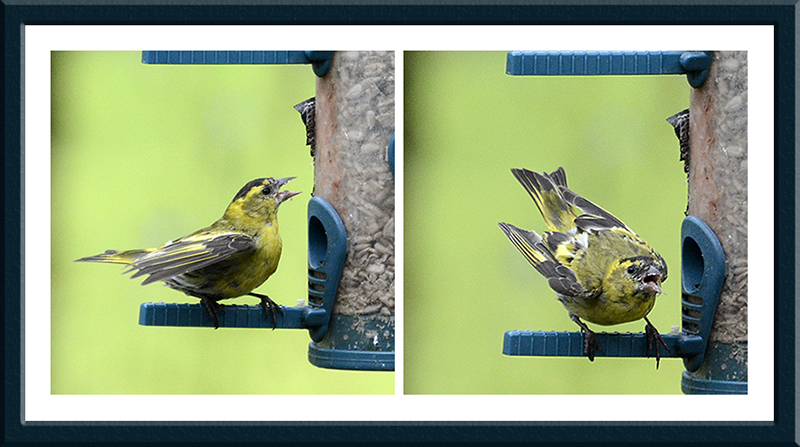 Mrs Tootlepedal spent a large part of the day in the garden and I spent some time there too. During the day, I turned compost Bin A into Bin B and before I had turned my back, Mrs Tootlepedal was already busy filling up Bin A again. At least the bins are in the right order now with the newest compost in Bin A and the oldest in Bin D. I shall have to get busy sieving the contents of Bin D but I need a little dry weather before I can do that properly. 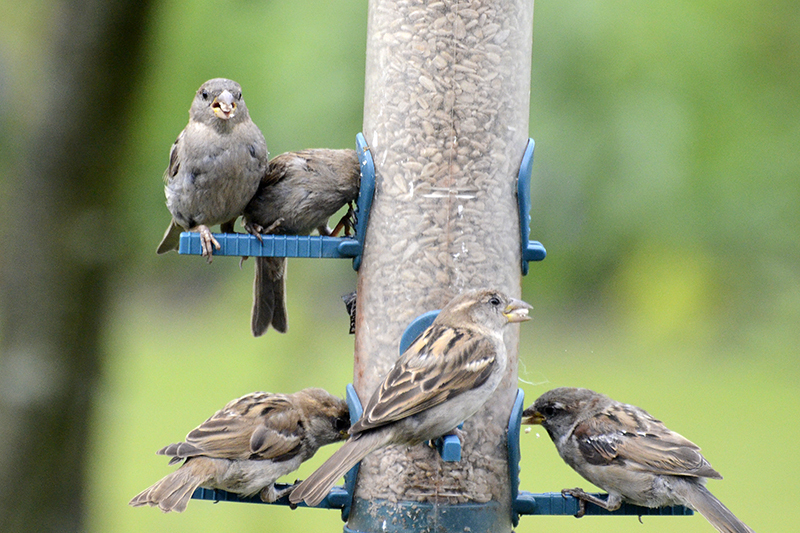 The feeder was busy again…. 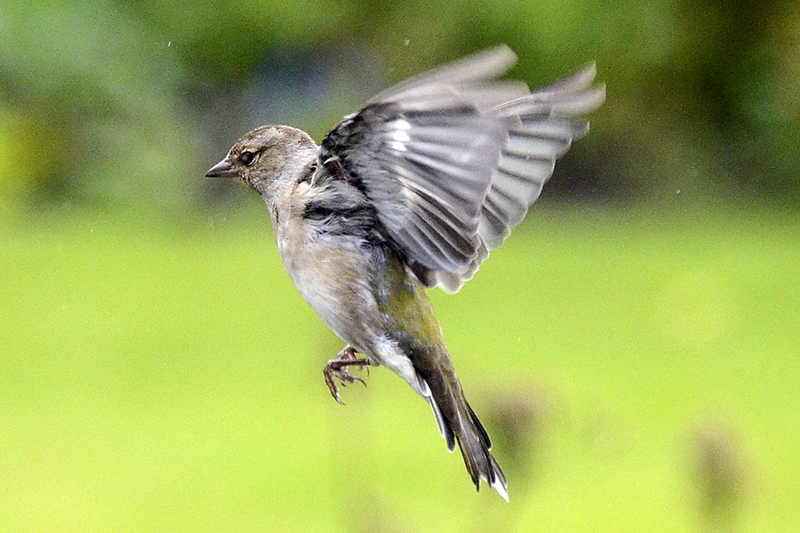 The chaffinches are more modest in their approach and often look a bit apologetic about barging in. 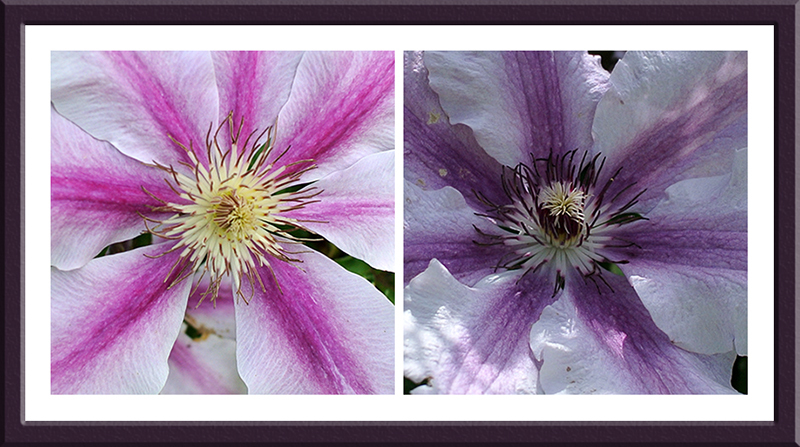 It was very agreeable to have some good light to look at the flowers. 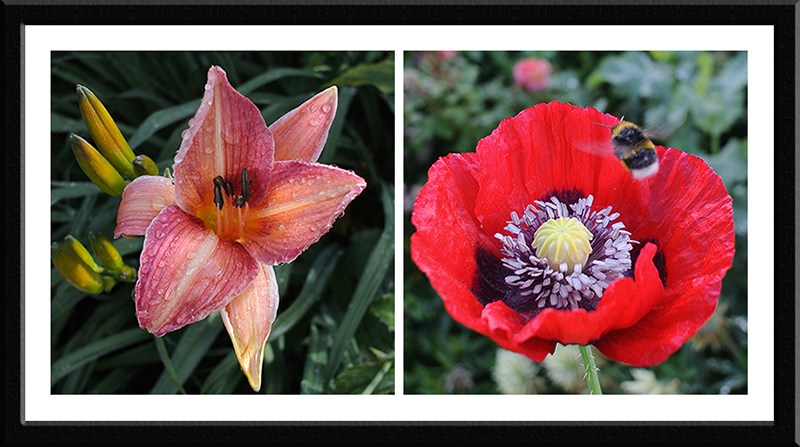 Although things were still damp as you can see from the day lily, at least the poppies could hold up their heads. 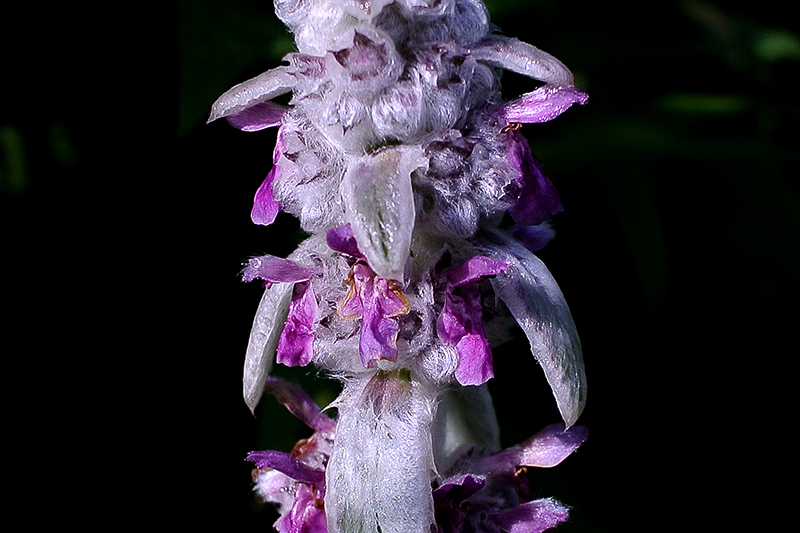 The stachys lanata or lamb’s ear was positively glowing with delight at seeing some sunshine. I made some lentil soup for lunch and as I was cooking it, we were visited by Scott, the minister. He is taking part in a hundred mile cycle sportive in London at the weekend. He had brought his bike round to see if I thought that there was anything that needed doing to it. This is mass entry event with thousands taking part and he is looking forward to it. He has done lots of training for the event but his one worry is mechanical failure or punctures during the run as he has no knowledge of bike mechanics and can’t change an tube. I offered to show him how to do it but he felt it was too late to master the skill so close to the event. I pumped up his tyres for him, patted his bike and wished him well. He will rely on a Good Samaritan helping him if disaster strikes on the way round. The soup turned out well and I thought that I would go out for a short pedal myself after lunch. 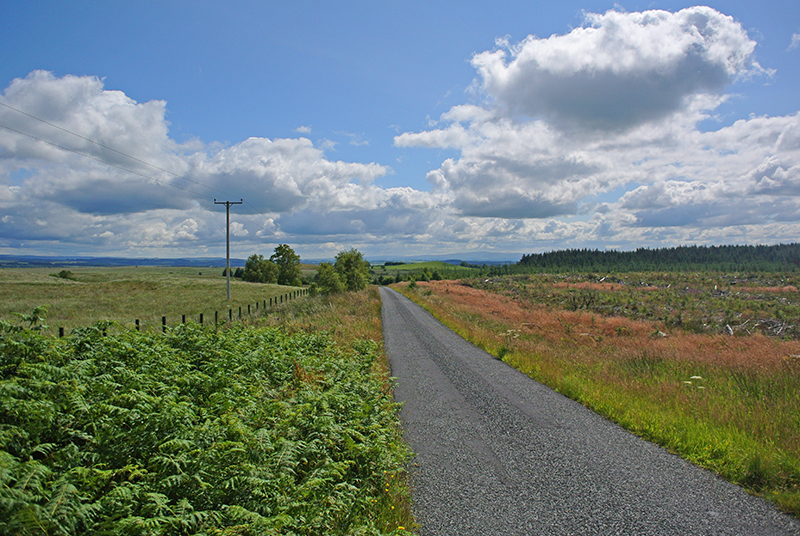 Rather annoyingly, as soon as I had got my bike kit on, it started raining out of a clear blue sky. It was only a passing shower though and I was soon on my way. My knee is still not fully back to normal and as I had done thirteen miles last time that I went out, I thought that I might do fifteen to eighteen miles today. 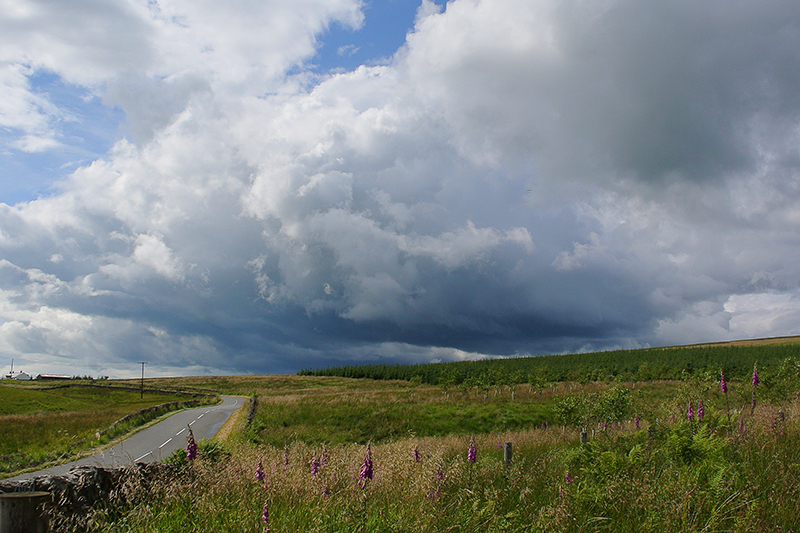 However, when I got to the top of Callister, the sight of these clouds in front of me…. 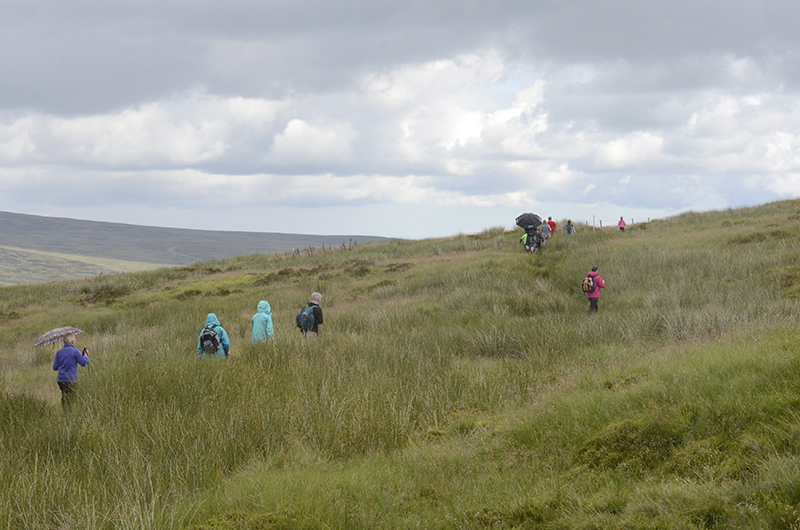 …and this heavy rain shower in the valley behind me…. 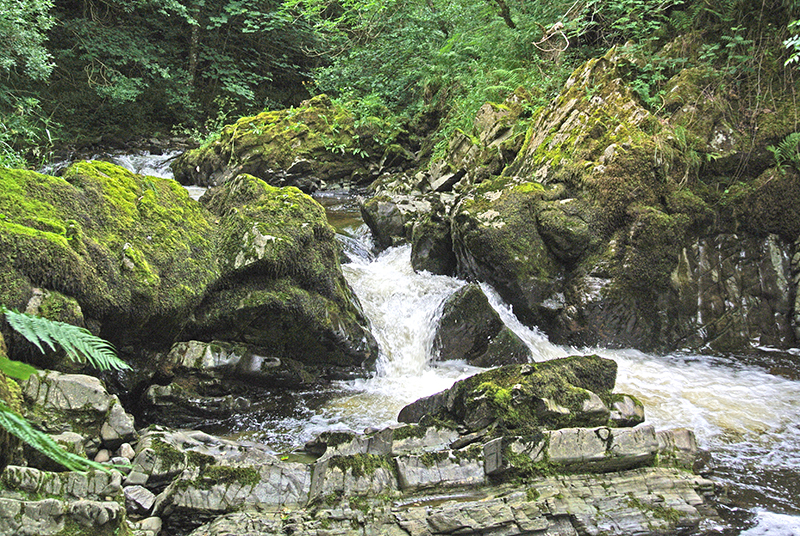 …persuaded me that twelve miles might be quite enough and I turned for home. 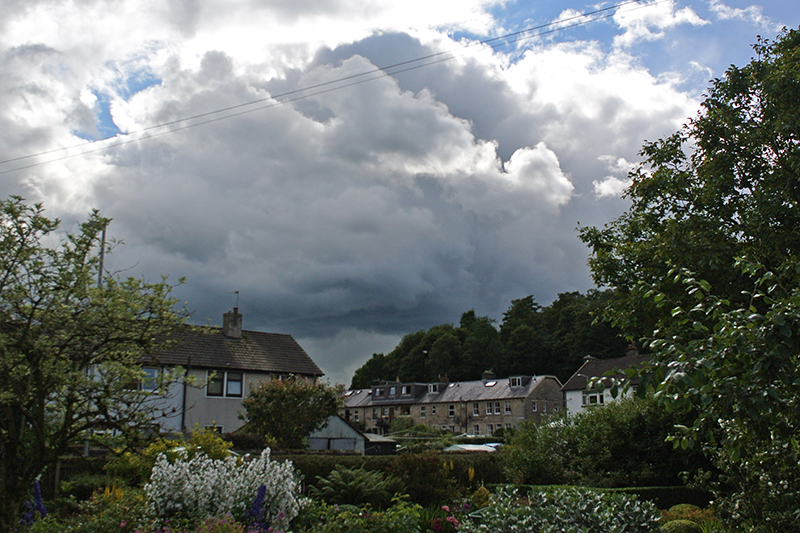 I got there safely, quite dry and with my knee in good order but looking back from the garden, I could see that the clouds had been following me down the road. 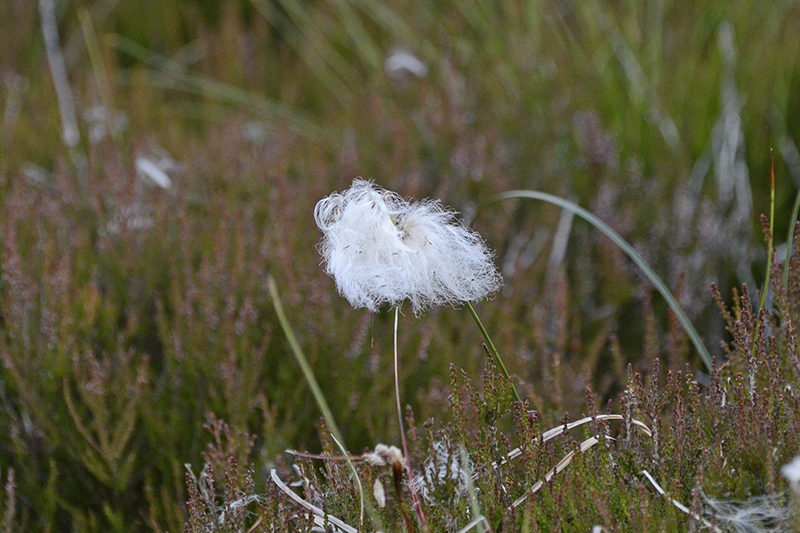 Mike Tinker, who was discussing a cup of tea and a dainty biscuit with Mrs Tootlepedal when I got in, has done some research and tells us that the white thistle we saw yesterday was a marsh thistle which very occasionally produces white flowers. As always, he is a mine of information. 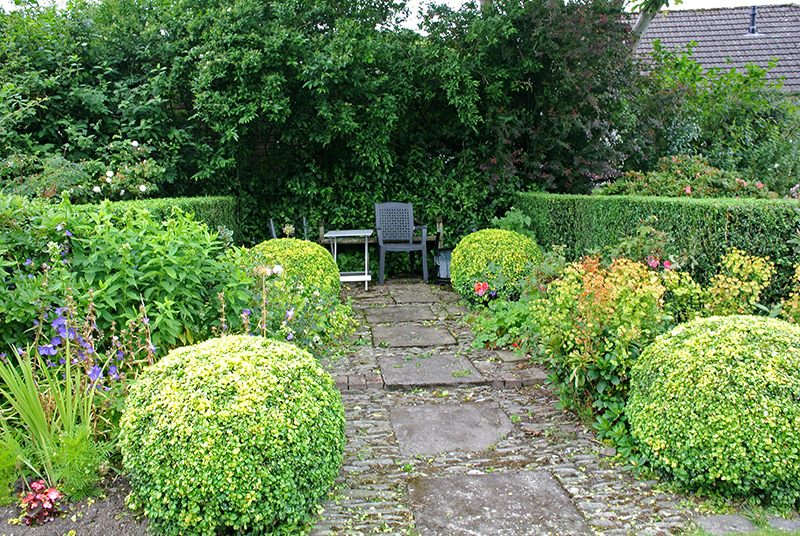 Amazingly, the rain stayed away from the garden and let Mrs Tootlepedal finish trimming the internal hedges…. …and me mow the middle lawn. When I finished that, I picked a couple of pounds of blackcurrants and looked round the garden to see what I could see. Lilian Austin and Special Grandma perked up in the sun. 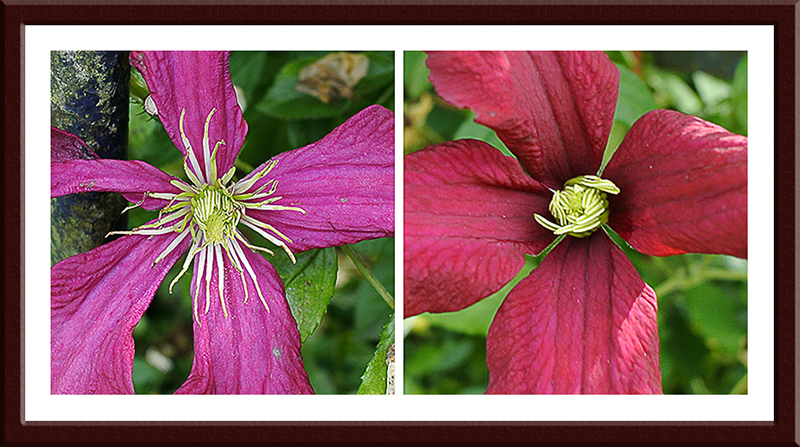 There are now four clematis blooming on the fence along the vegetable garden. 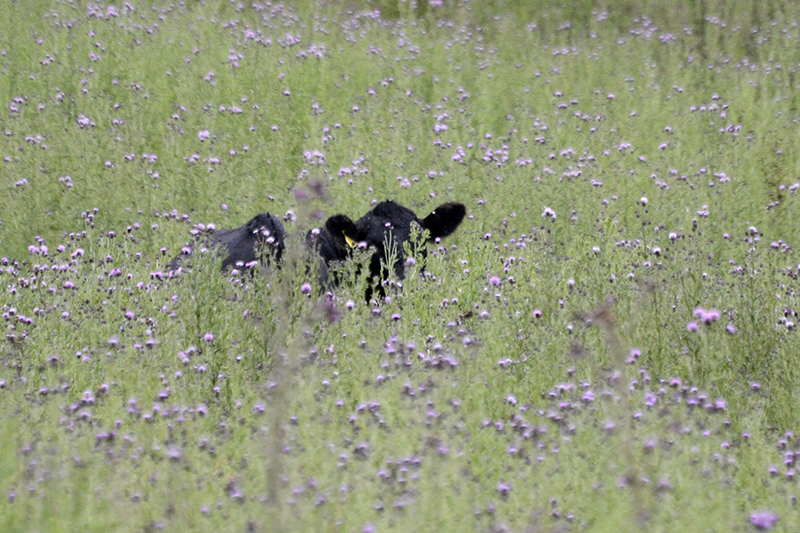 As always, I enjoyed peering closely at flowers…. 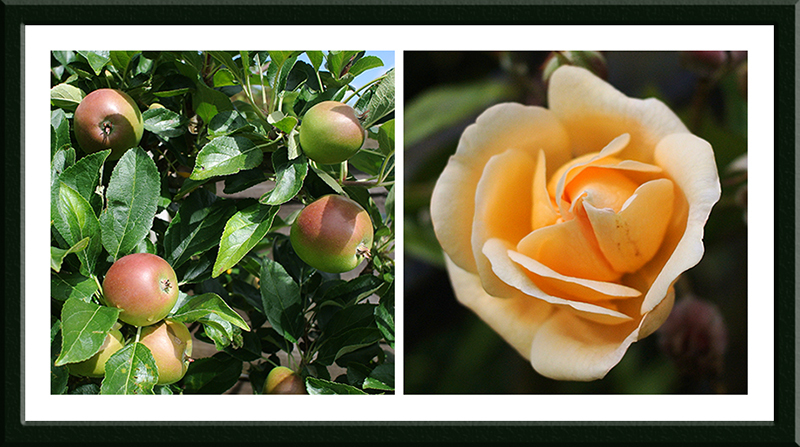 ..and the Goldfinch rose once again surprised me by how much it changes as it grows older even side by side on the same stem. 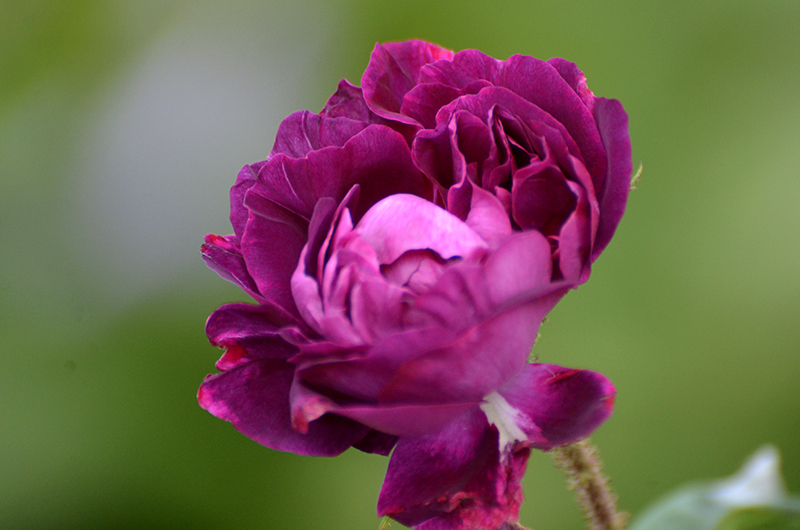 My favourite rose of the day though was one of the moss roses. We had potatoes, broad beans and turnip from the garden for our tea and there is no doubt that home grown food always tastes better than the shop bought stuff (and even when it doesn’t taste better, it feels as though it does). I am hoping to get a few more miles in tomorrow as the forecasters are speaking of another dry day. 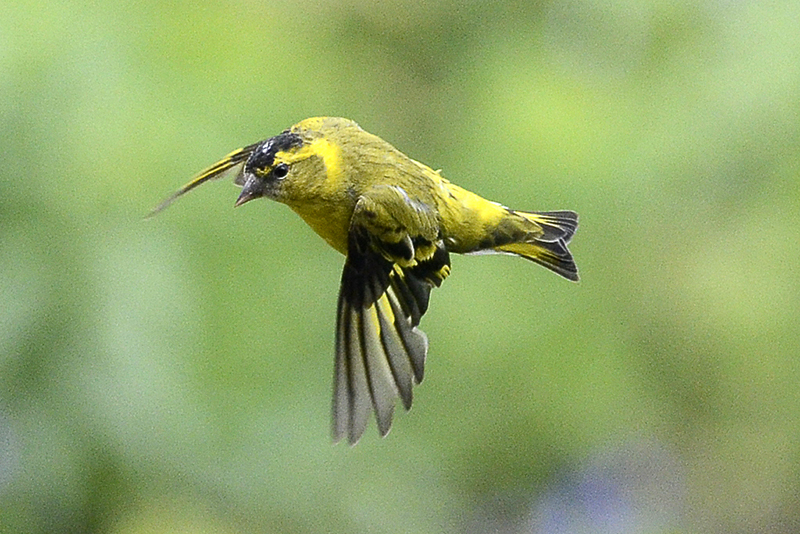 The flying bird of the day is a siskin looking for someone to argue with. Today’s guest picture comes from my Newcastle correspondent who has deserted our cool damp weather for the blazing sun in California while she visits her brother who lives there. 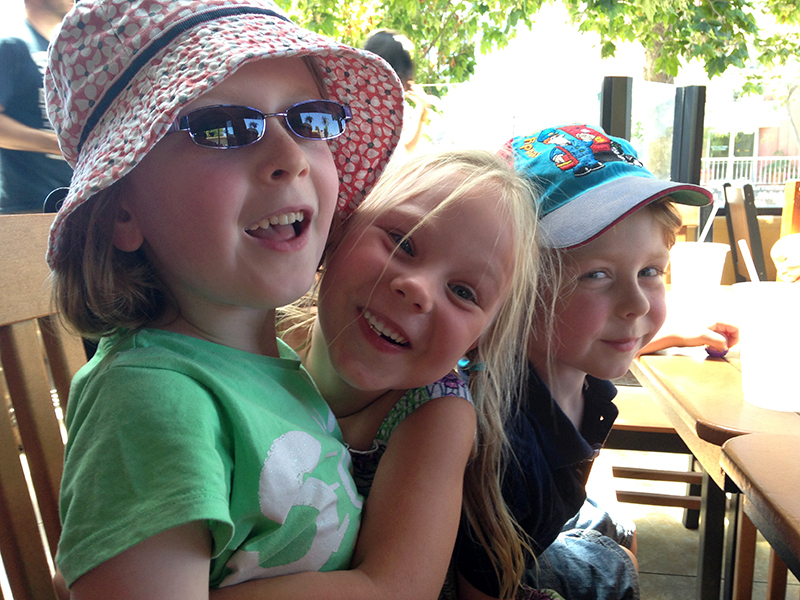 She sent me this picture of her children suffering from the heat there and being comforted by their cousin. 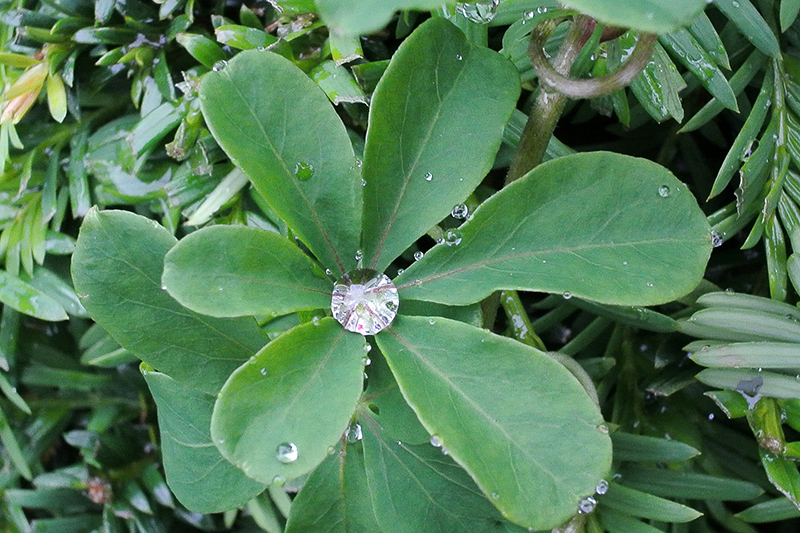 We had another day of continuous rain here, the only variety being in the amount coming out of the sky at any one time. I had an appointment in Carlisle to get two watercolour paintings which have been entrusted to the Archive Group valued and Mrs Tootlepedal came with me to make sure that I didn’t run off if they turned out to be worth millions. 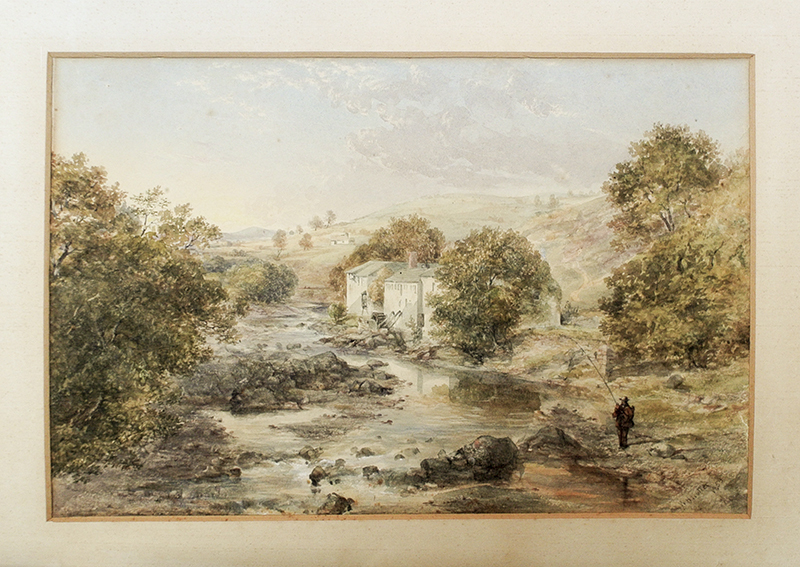 The valuer was a very charming man who was pleased to see the paintings which are by W H Nutter, a Victorian artist, well know and admired in Cumbria. He said that he had never seen paintings of Langholm by this artist before and added that this would oddly make them less valuable as it is the Cumbrian pictures that are most sought after. You can tell by the fact that I am still here, that they were valued at less than millions (or indeed thousands) but they are valuable enough to make sure that we look after them well. 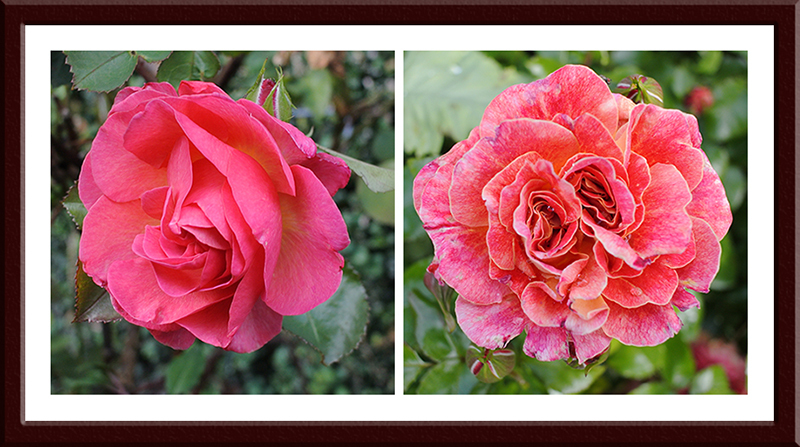 I have had them framed and the next thing will be to see if some restoration can be done at a reasonable price. We made good use of the trip to Carlisle by adding a little necessary shopping to the morning. 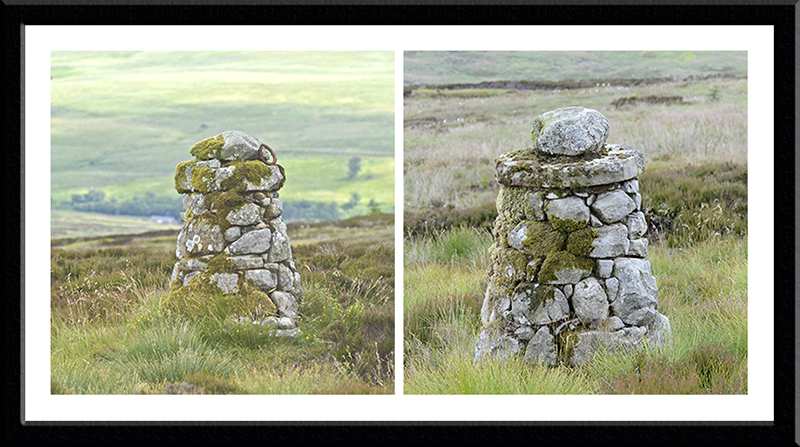 Because I have been asked to provide two copies of one of my local photographic views to a friend, frames and mounts were on the list and we added some French, Italian and English cheese to these so the morning was well spent. 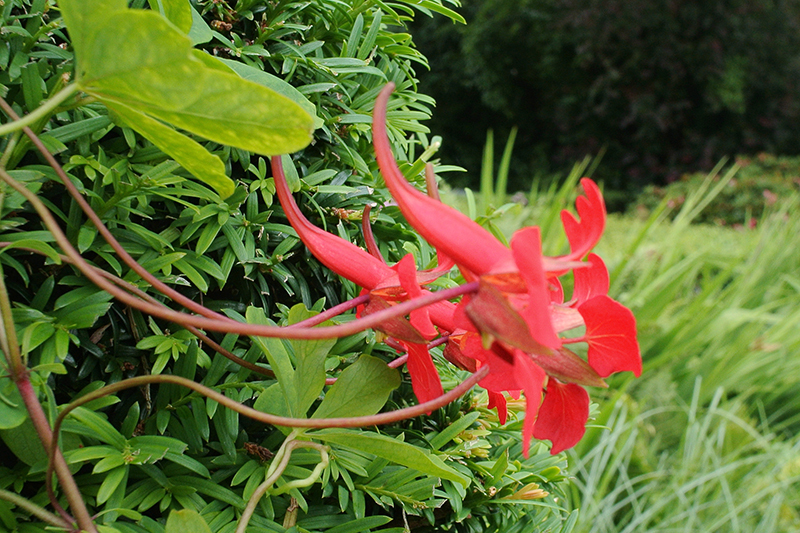 I had a walk round the garden when we got back, as it was one of the moments when the rain was quite light. 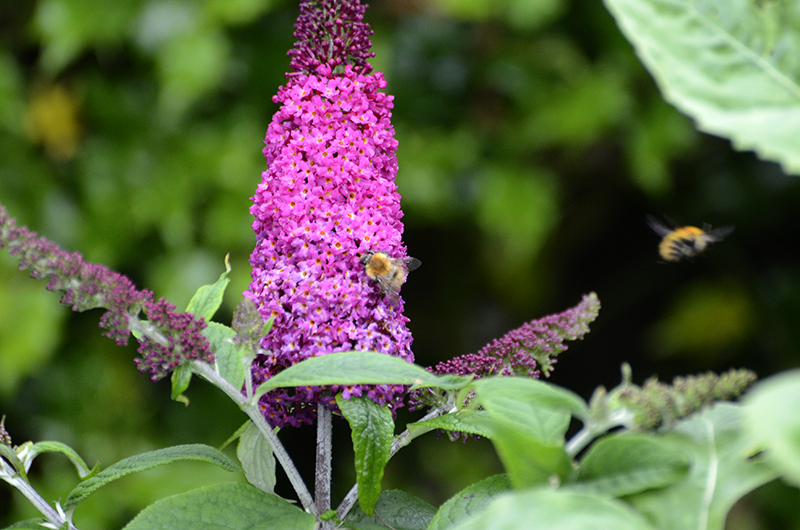 Mrs Tootlepedal recently bought and planted a buddleia for me which I hope will attract butterflies. 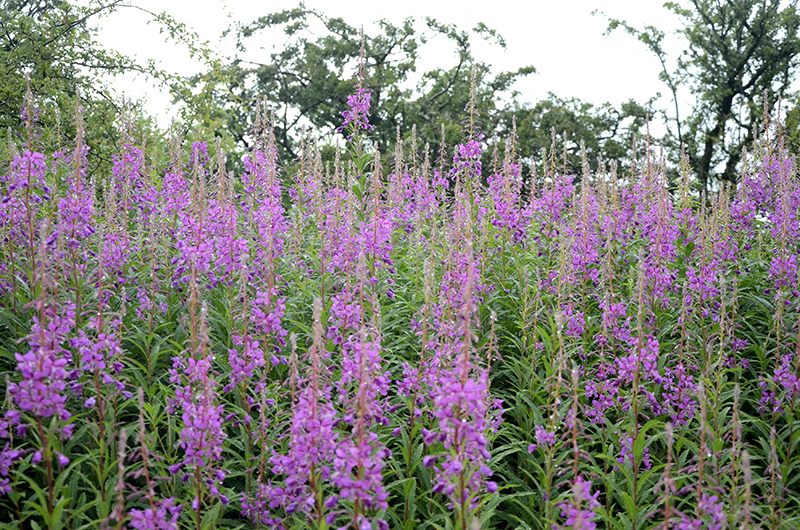 It is growing well but has only got as far as attracting bees at the moment. 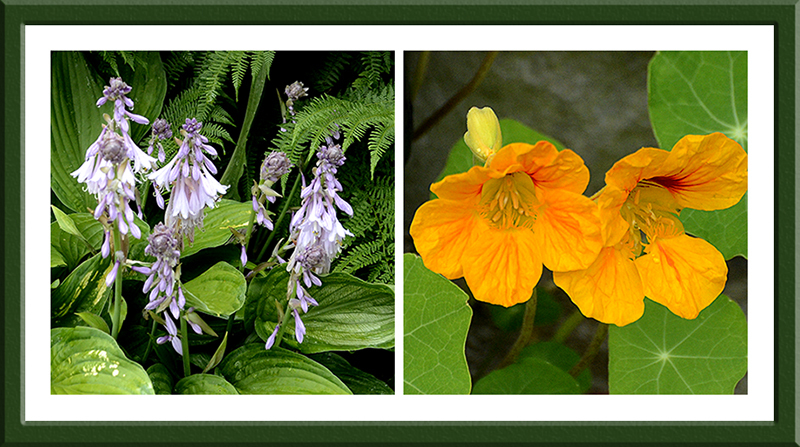 …but nasturtiums and hostas are not such wimps. 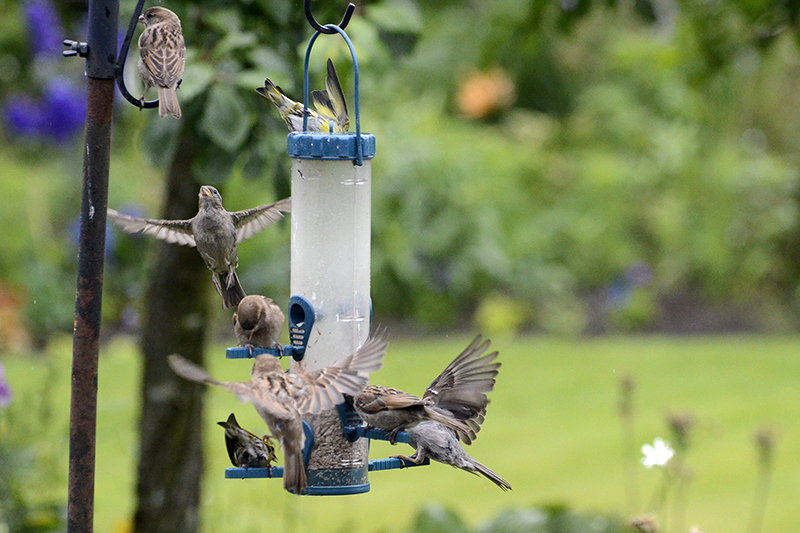 At the bird feeder, queues were forming. 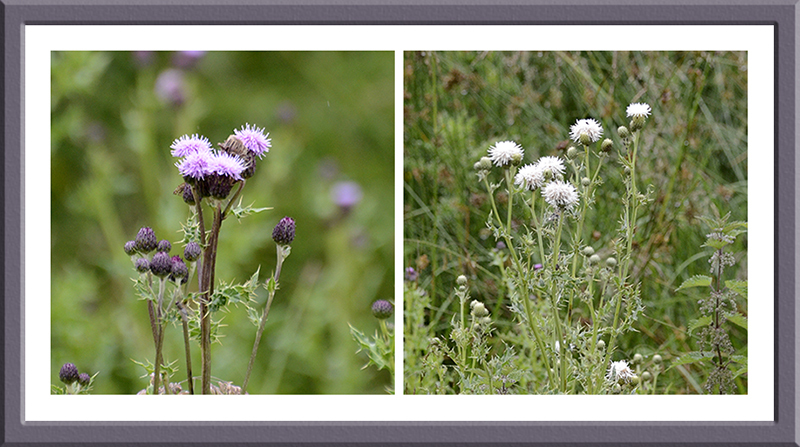 About three o’clock, another lull in the rain gave me a bit of hope and, clutching an umbrella to protect my cameras, I went on a short walk up the Wauchope road to see an unusual thistle. I had passed it while cycling and I had taken Mrs Tootlepedal to visit it in the car when we came back from Carlisle because she hadn’t quite believed what I had actually seen it but when she saw it herself, she was convinced. 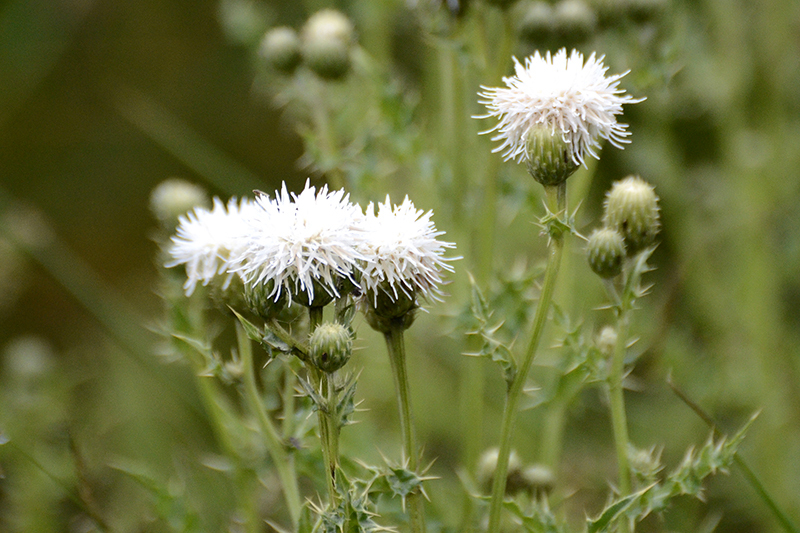 It was a white thistle. 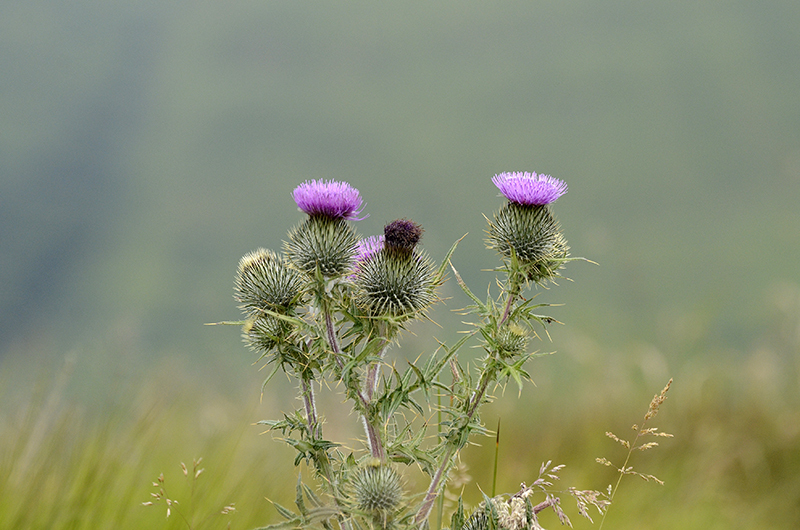 There were quite a few of them about among a field of more conventionally coloured thistles. 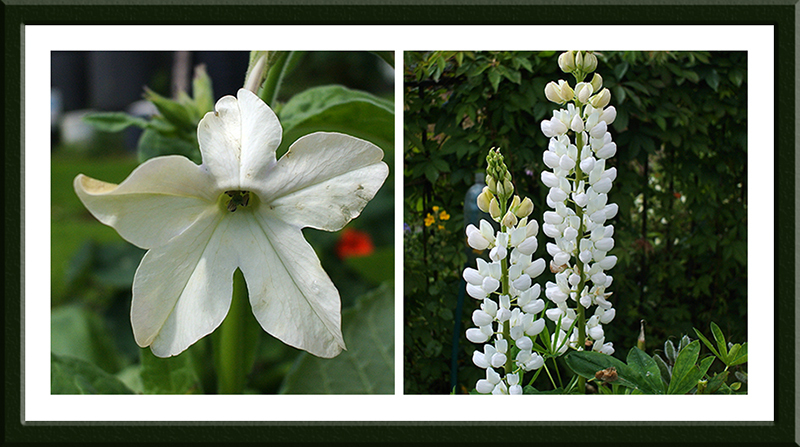 They are definitely white flowers and not just washed out old pink ones because you can see white buds waiting to come out. 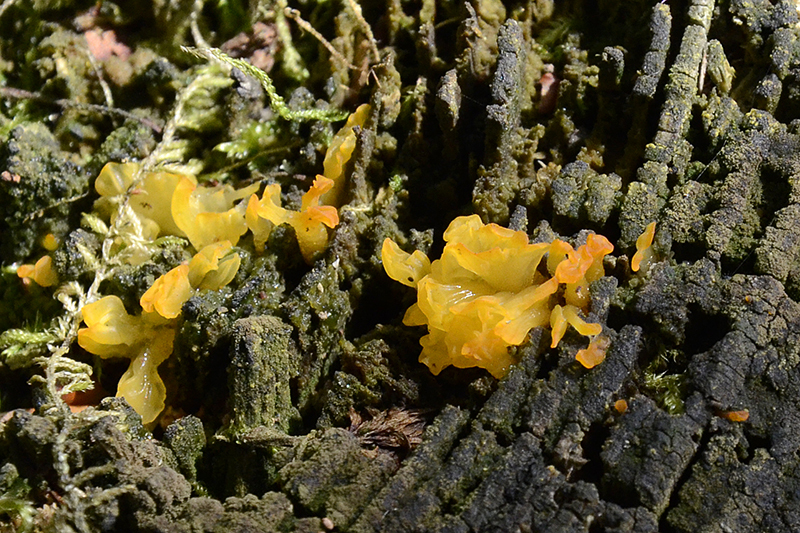 We have never seen these before. 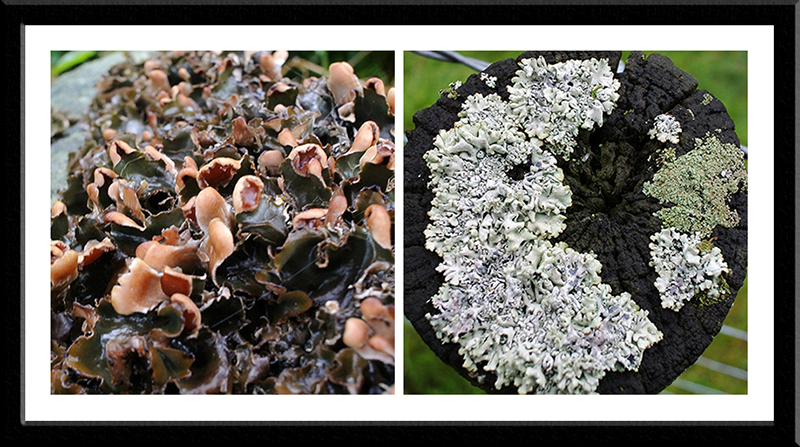 I was distracted by lichens on walls and fence posts as I walked. 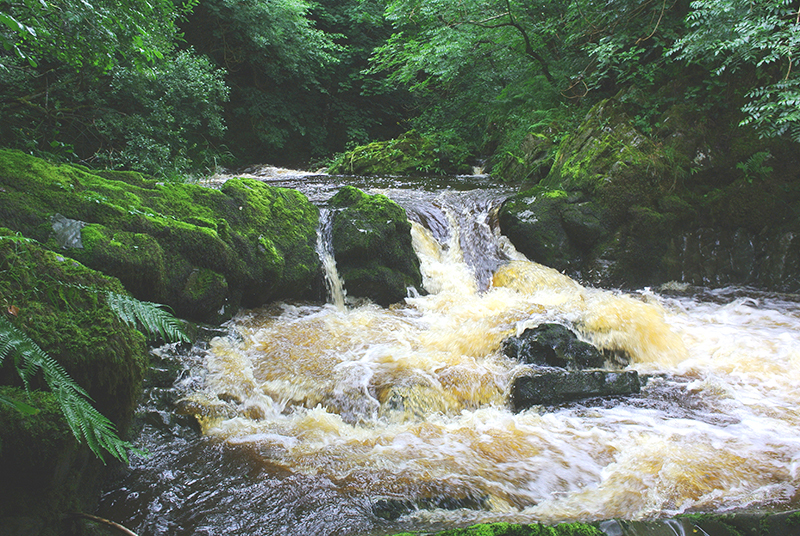 While I was up the road, I walked a few hundred yards further and took a look at my favourite cascade…..
…and found a bit more water going over the rocks than on my last visit. 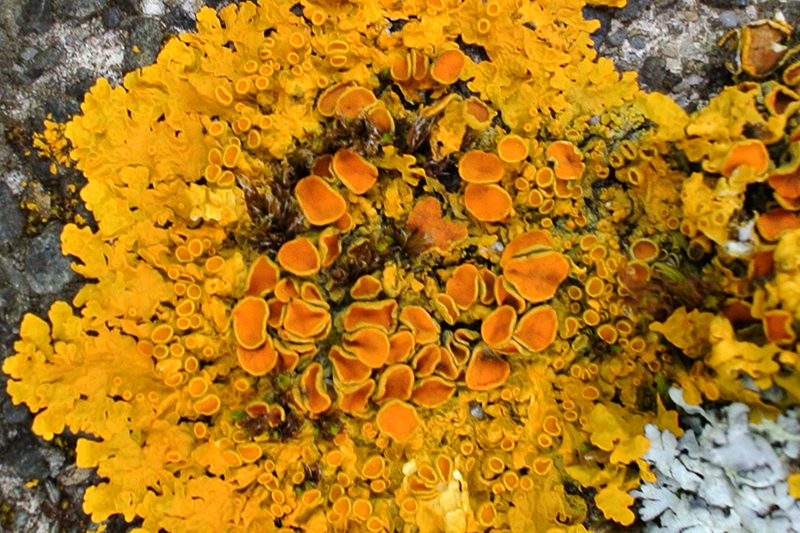 …and the bank is covered in growth. 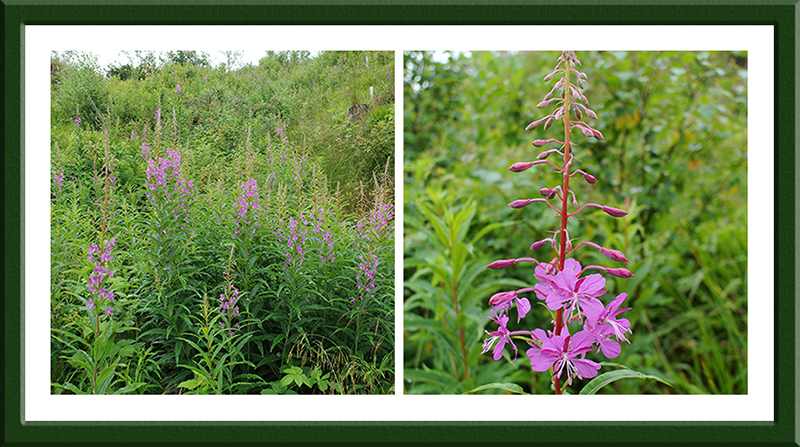 Rosebay Willow Herb is in fashion at the moment. 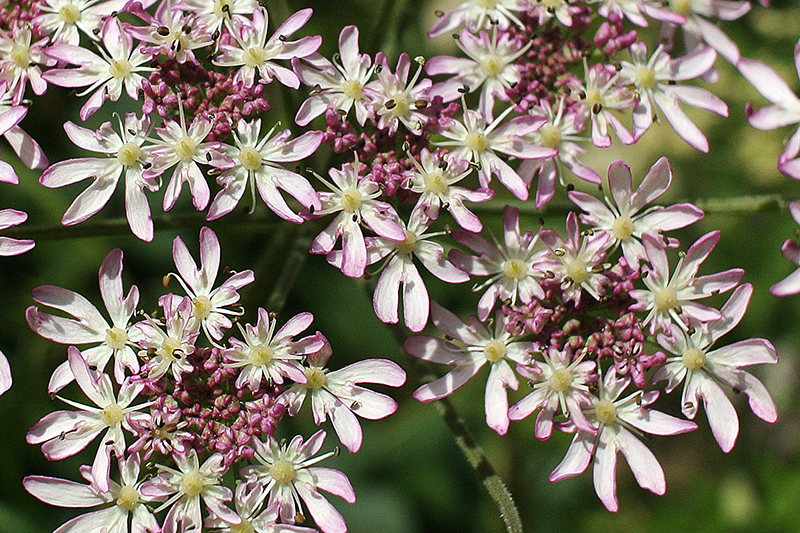 …both small and big and plenty of wild flowers too. 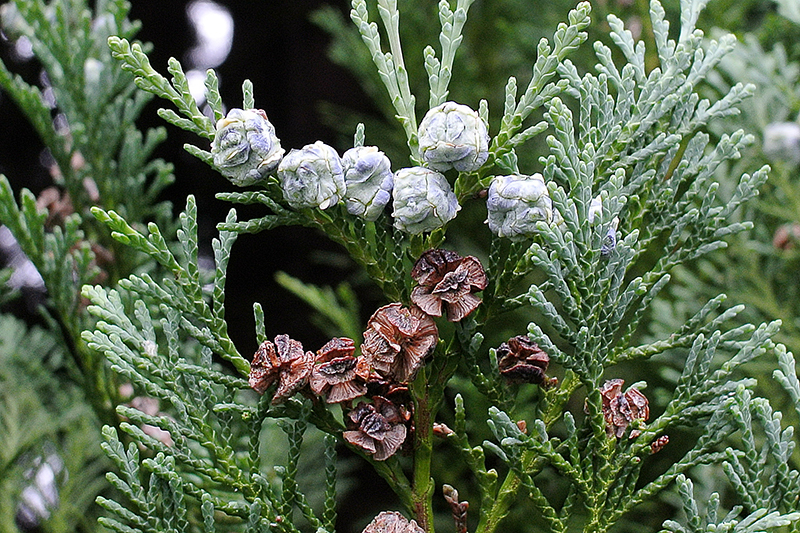 I came back down through the park and stopped to look at the fruit on a cypress tree beside the war memorial. 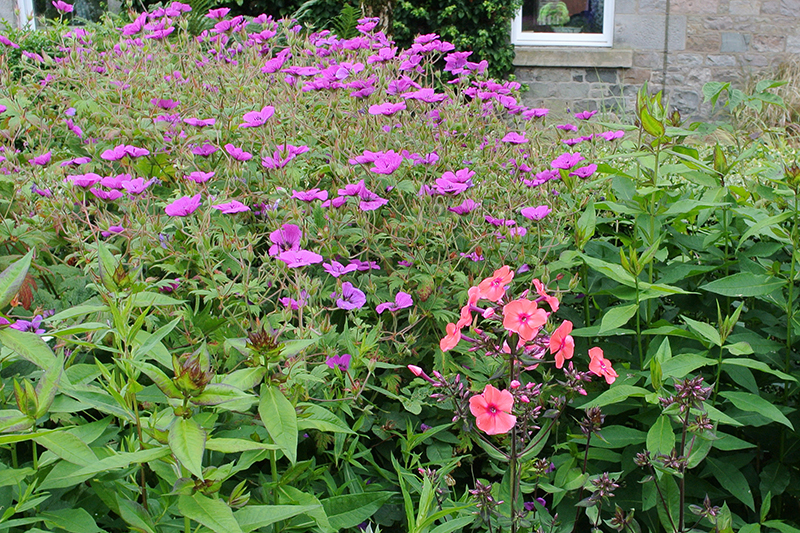 In spite of the rain, there was colour both at the back of the house when I got back…. 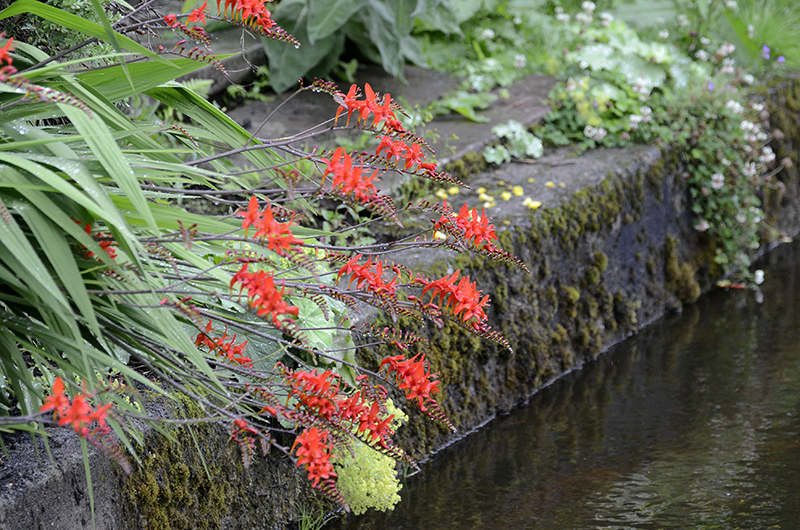 Crocosmia hanging over the dam. During my walk, I was conscious of agents keeping an eye on my movements. Sheep on Stubholm give me a hard stare. The one on the left apparently has no eyes and the other apparently has four. The rain got heavier after I returned home and that was the end of that. In the evening, our neighbour Margaret took us to a pre Common Riding evening at the Masonic Lodge where the chief speaker was her grandson. He did an excellent job and as he was joined by a competent and varied lot of local singers as well as other good speakers, we had an enjoyable evening. It had the added advantage of not going on too long which was very welcome. I don’t want to get too excited but the forecasters say we might get a glimpse of the sun tomorrow. 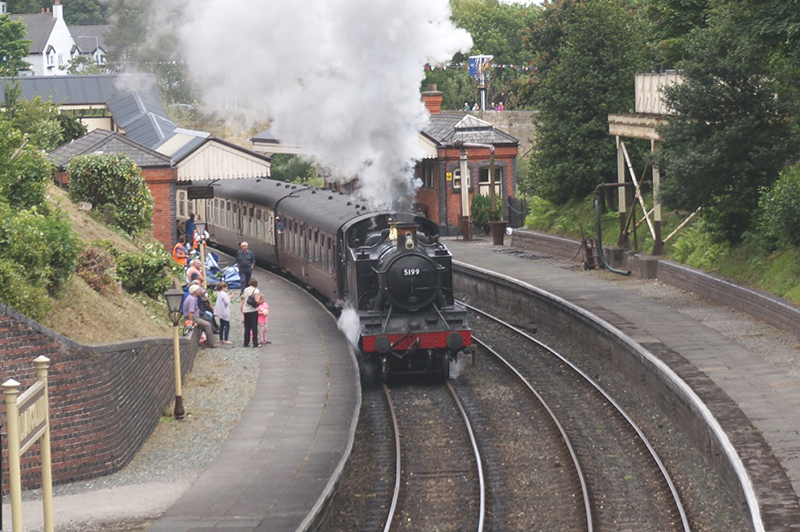 Today’s guest picture is another from Bruce’s visit to Llangollen. Since some readers enjoyed his picture of the train arriving yesterday, I thought that I would add this one of the train departing today. It was raining gently but persistently when we got up and it will be raining gently but persistently when we go to bed. In between, it rained gently but persistently, the only variations being between sometimes very gently and occasionally quite hard. 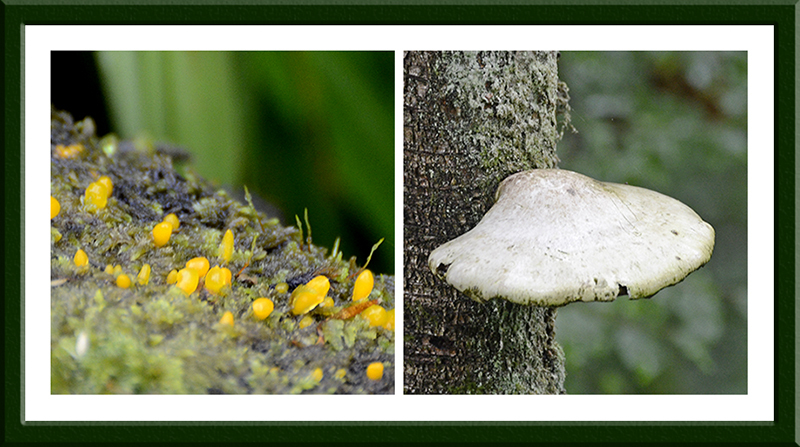 The temperature was autumnal and the outlook is equally gloomy and wet. It was not, in itself, a very cheerful day. I put a week of the newspaper index into the archive database. I have almost reached the end of 1890 but a cheerful data miner told me that the mining team are up to March 1891 already. I know how that chap Sisyphus felt. 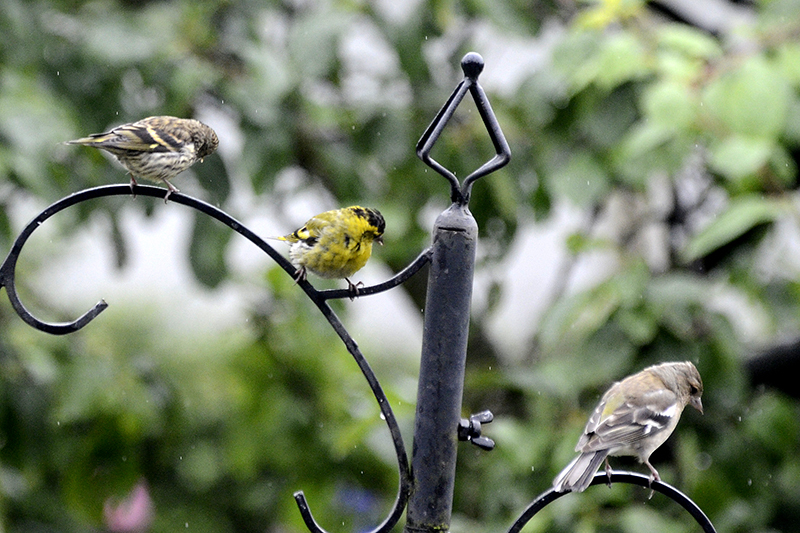 After coffee, the rain entered one of its gentle moments and I spent some time staring at birds getting in the way of the raindrops. 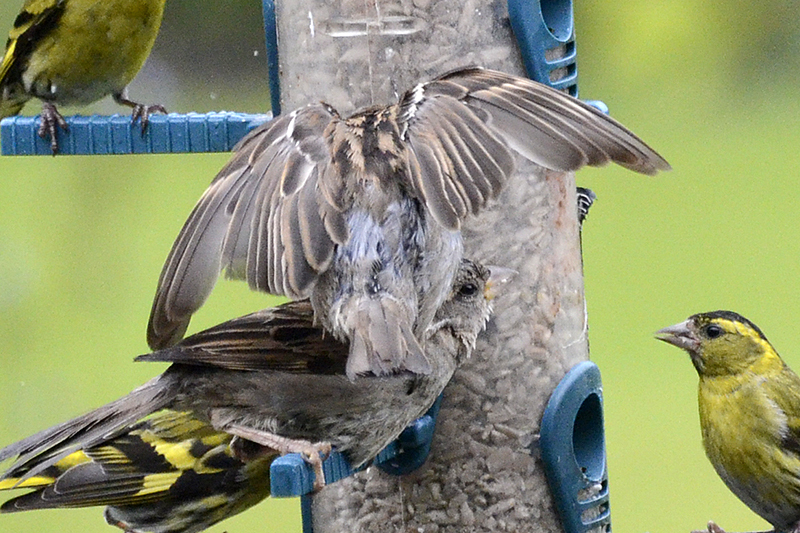 Once again a positive blizzard of sparrows, with some siskins and a few chaffinches kept me busy refilling the feeder. The rush led to some regrettable behaviour. 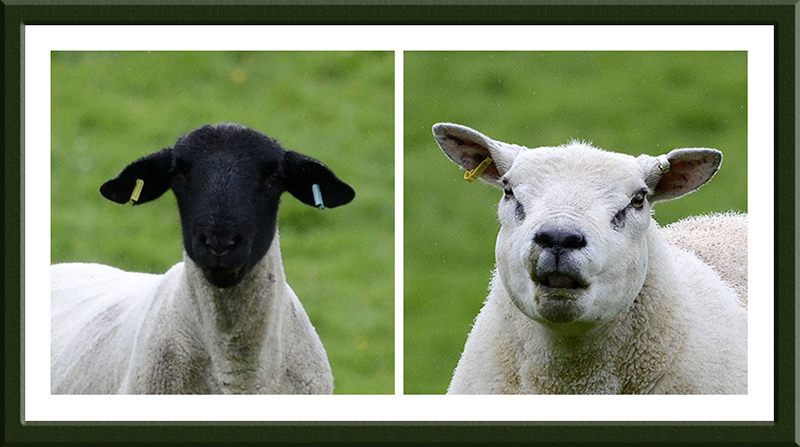 You might think the next picture charming…. …if you didn’t see the subsequent shoulder charge. 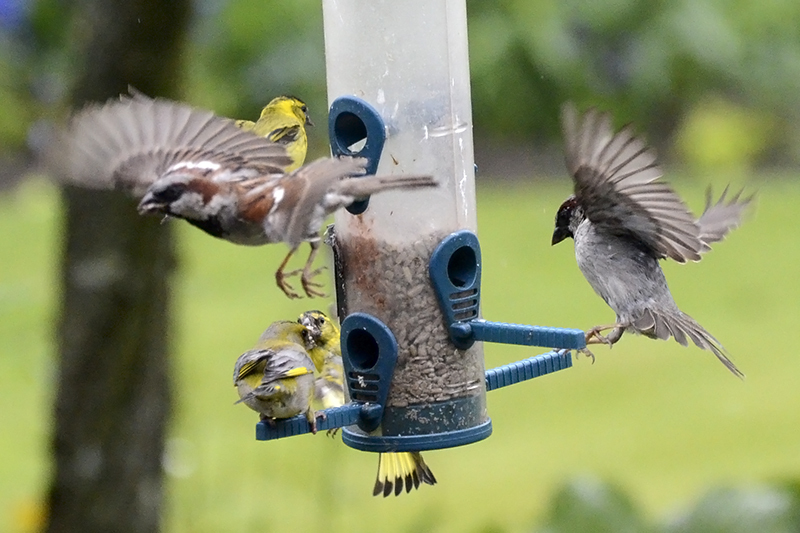 There was no shortage of flying birds this morning. 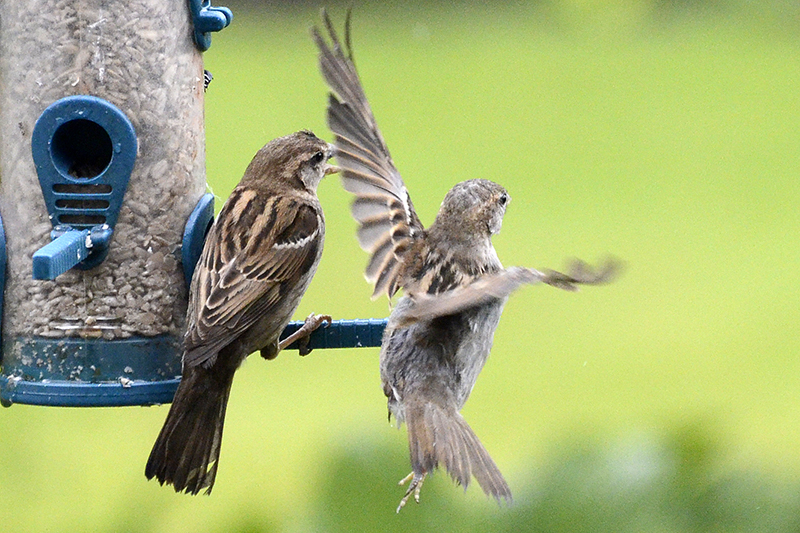 Note that the sparrows approach boldly while chaffinch is keeping a good look out for bullying sparrows. 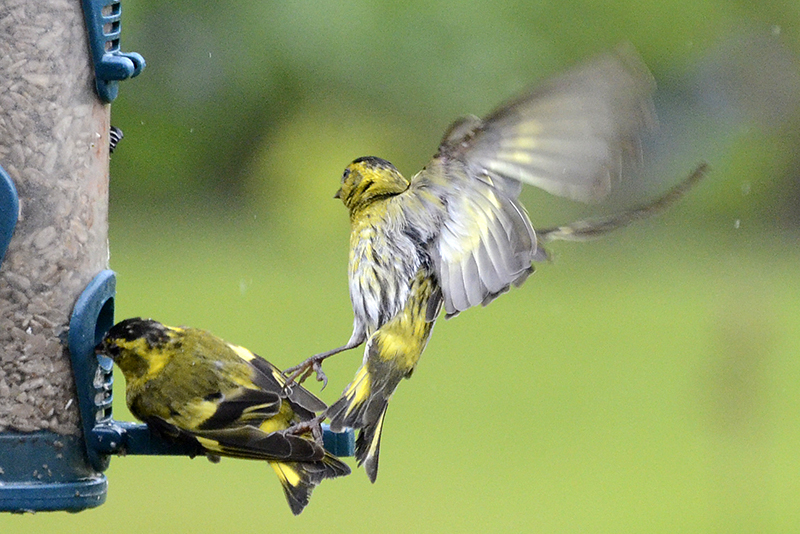 The siskins aren’t afraid of anyone (except other siskins). 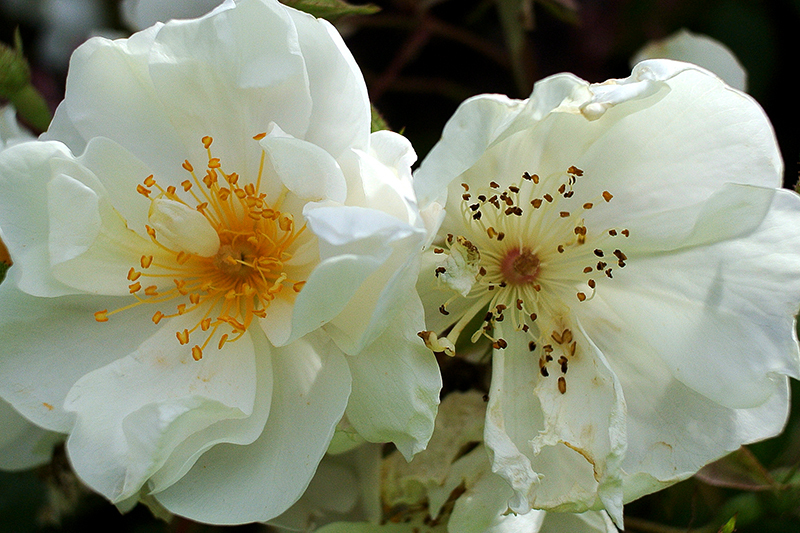 …but the others looked a bit pale and wan today. The rain hit a moment when it looked tolerable enough for a walk and Mrs Tootlepedal and I were just going out when I remembered in the nick of time that I was supposed to be on duty in the tourist office. I left Mrs Tootlepedal to enjoy the rain and scooted up to the High Street and arrived only a few minutes late. I then spent the next two hours dealing with a single tourist who wasn’t needing any information. I did have non-tourist visitors though; first Sandy for a chat, then the data miner to keep me up to the mark and finally the Cornet with his right and left hand men so I was honoured. When I got home, I spent some time practising my singing and flute playing. As I am not very methodical, I don’t know whether footling about can strictly be classified as practising but I am adept at fooling myself so I imagine in the face of the evidence that it must be doing me good. 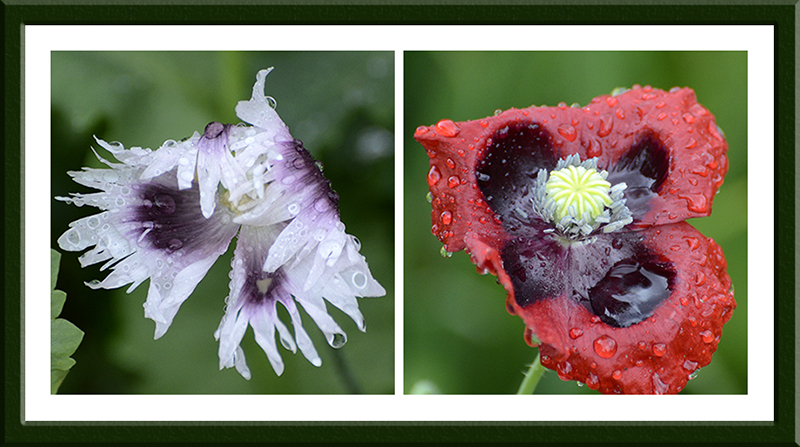 My only venture into the garden into the rain didn’t encourage me to take pictures but I did find one jewel while I was there. My flute pupil Luke came and we spent the time working on his fife playing as he he is intending to turn out with the Langholm Flute band on Thursday evening. 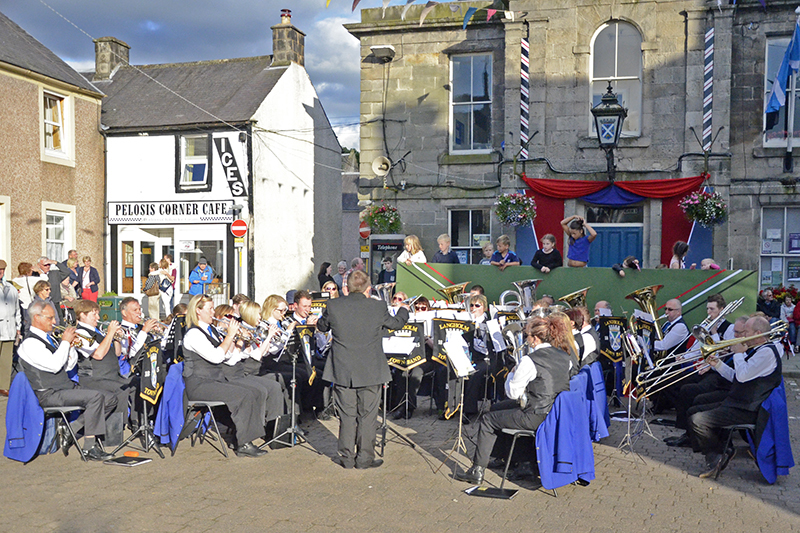 The Flute Band is a marching band which usually meets only twice a year, on the Thursday night before and the Friday morning of the Common Riding day and it would be fair to say that it is noted more for its enthusiasm than its musical polish. It’s characteristic sound is always greeted very warmly by the townsfolk. 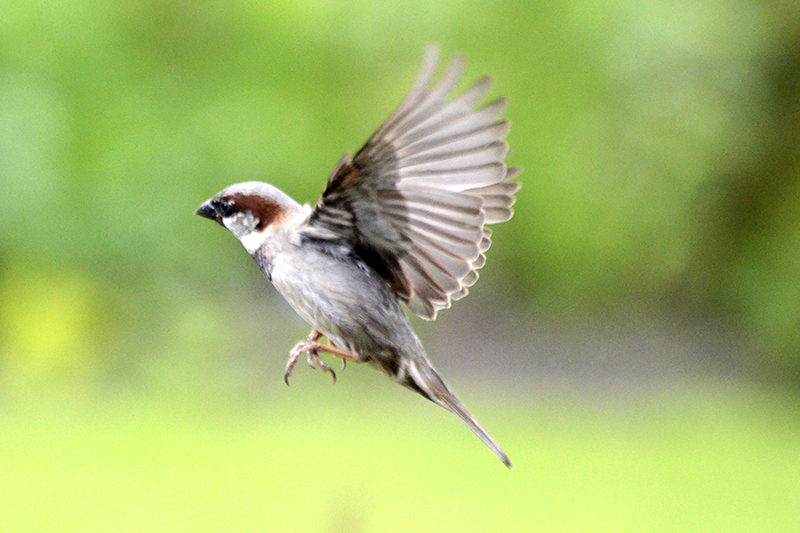 The flying bird of the day is unsurprisingly one of the sparrows. 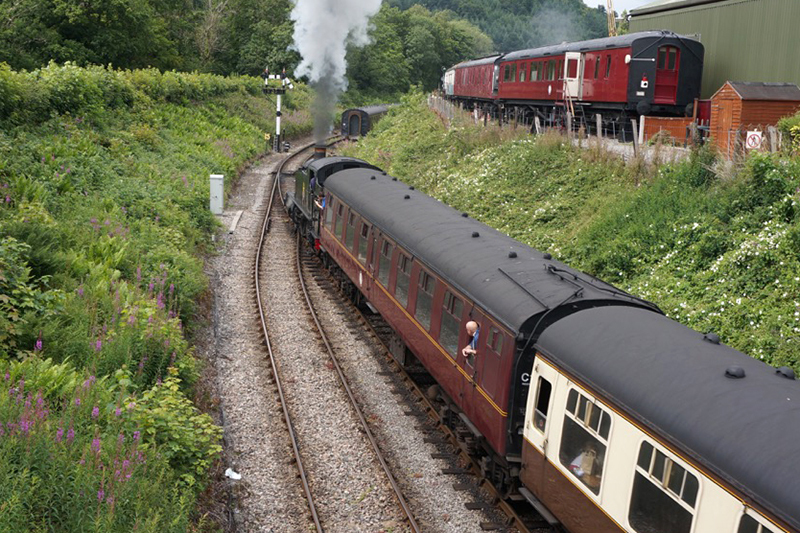 Today’s guest picture shows live steam at Llangollen. 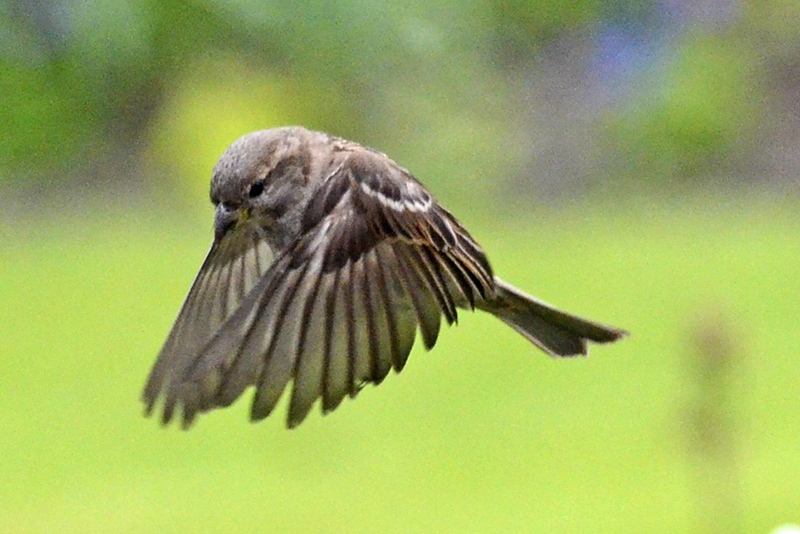 It was taken by my friend Bruce on a recent visit. I would have liked to have been there too. I woke up at six o’clock to see glorious sunshine peeping through the bedroom blind. What an opportunity to get up early, take some photographs and go for a cycle ride and all before breakfast, I thought. It was still reasonably fine, although the sun had gone in by the time I eventually got the fairly speedy bike out of the garage at ten o’clock. My plan was to test out the defective knee on a ten mile trip (or a little longer if everything felt good) and then see whether there were any after effects. In the event, I managed thirteen miles, including the gentle climb up Callister, and only felt a little stiffness while on the last mile. 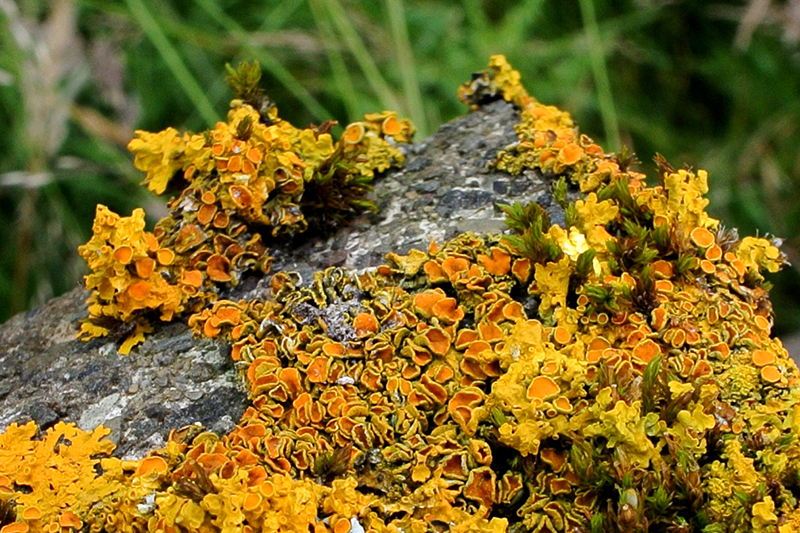 I stopped just once to celebrate the fondness of a bright orange lichen (Xanthoria parietina, the golden shield lichen) for battered concrete fence posts. 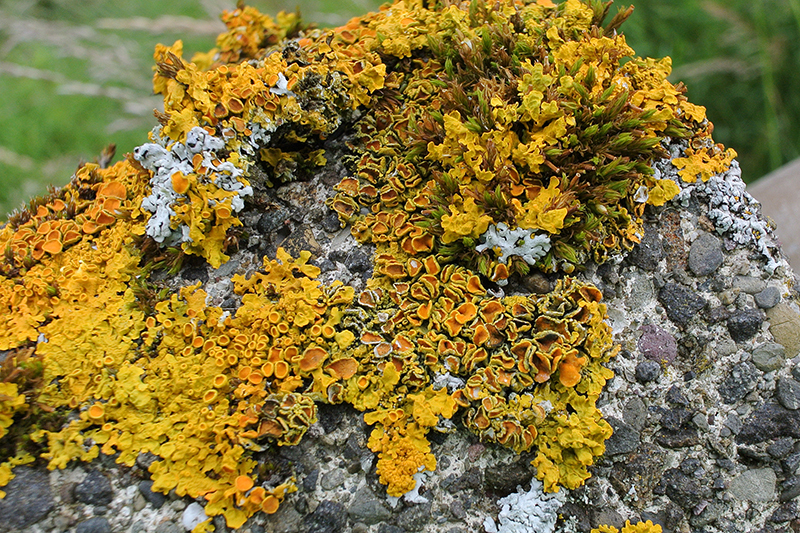 All the posts on this stretch of road host this lichen. Mrs Tootlepedal was still singing in church when I got back so I invited Dropscone round for a cup of coffee and Mike Tinker, exhibiting finely honed coffee scenting skills, dropped in to join us. As far as golf goes, Dropscone is still affected by shanking in his short game so listening to the story of his round on Saturday was a very traumatic experience for me as I suffered badly from the same ailment in the last couple of years before I wisely gave up the game. 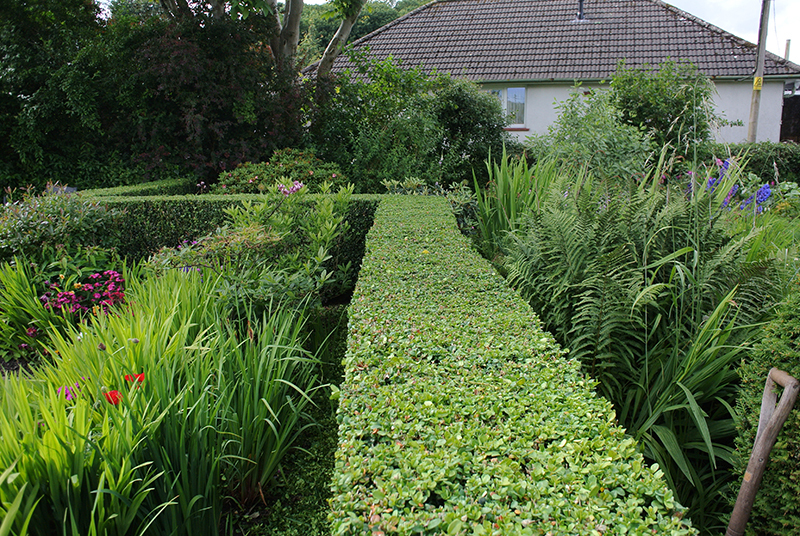 After Mike and Dropscone had gone, I clipped the last two box balls on the front lawn and then trimmed the hedges beside them. I needed a rest after that so Mrs Tootlepedal, who had returned from church, took up the hedge trimmers and continued the work. 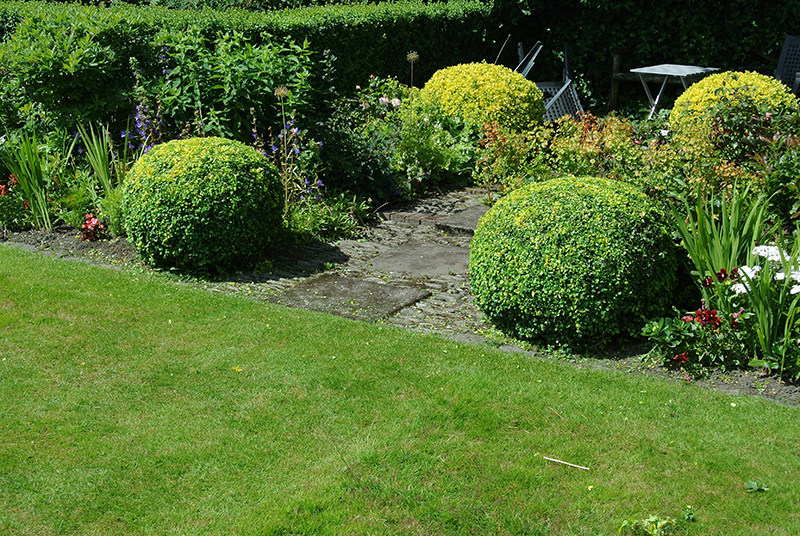 I had used garden shears for the box balls but an electric trimmer for the hedges and as it soon started to drizzle, Mrs Tootlepedal didn’t get much done before she had to give up. 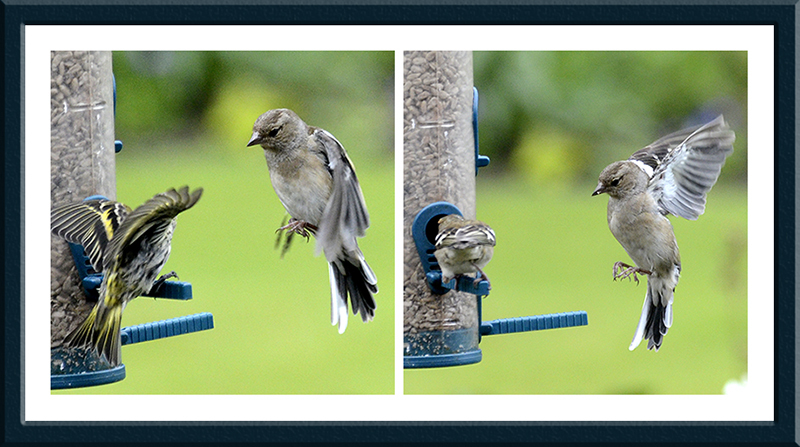 I hardly need to add that as soon as she had got everything safely indoors, it stopped raining. 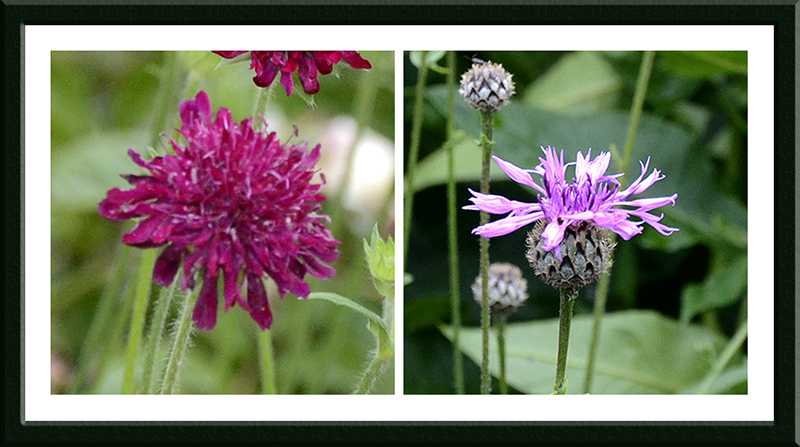 I took a few flowers pictures before the rain started. 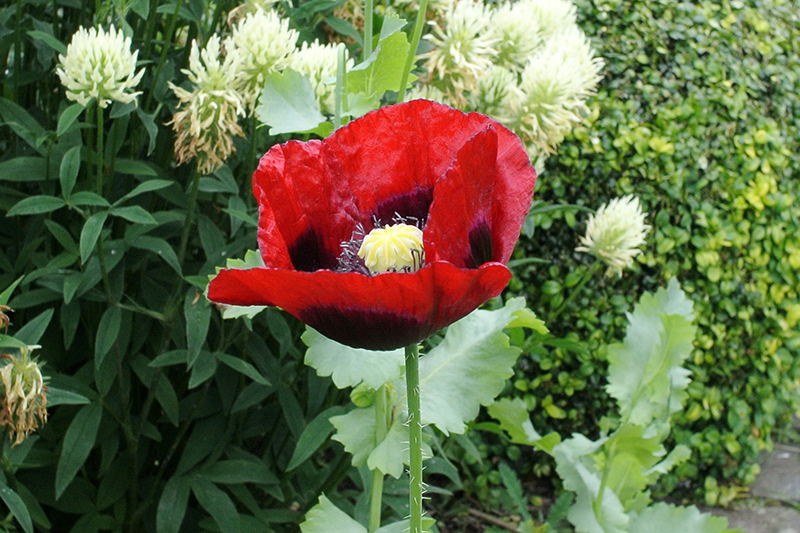 The poppies last about a day each but new ones keep arriving. 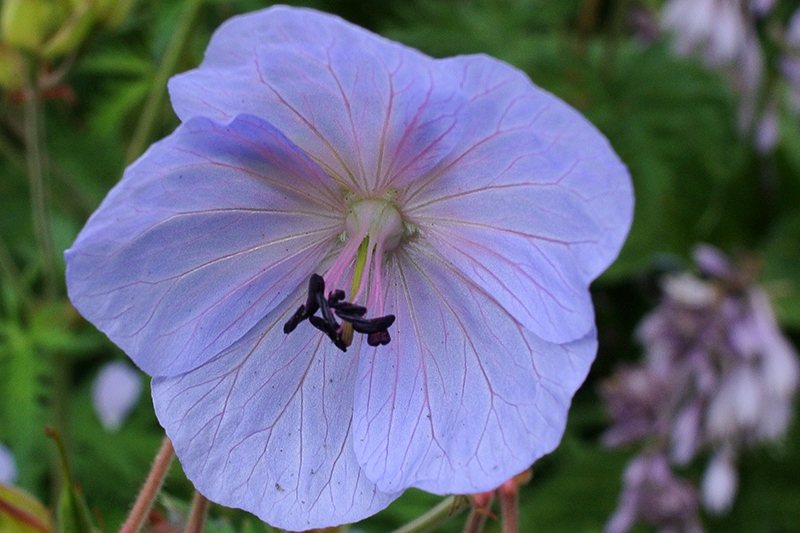 There are geraniums all over the garden. 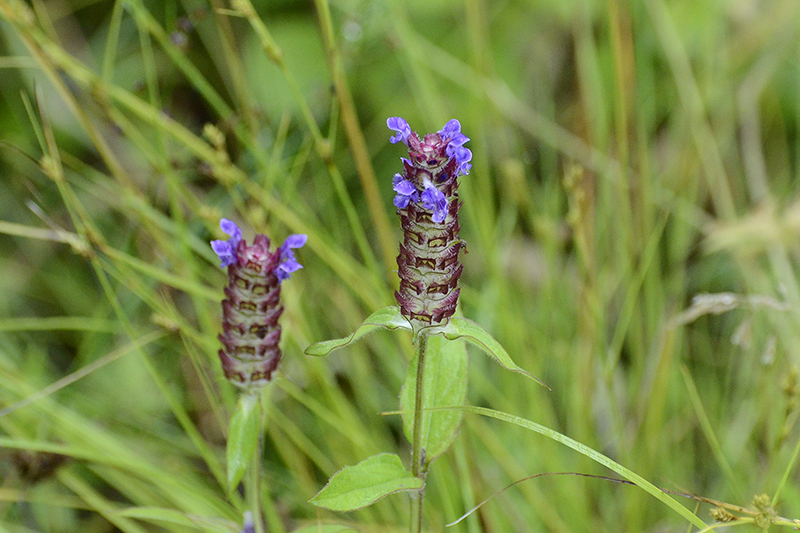 This one is in the back border. 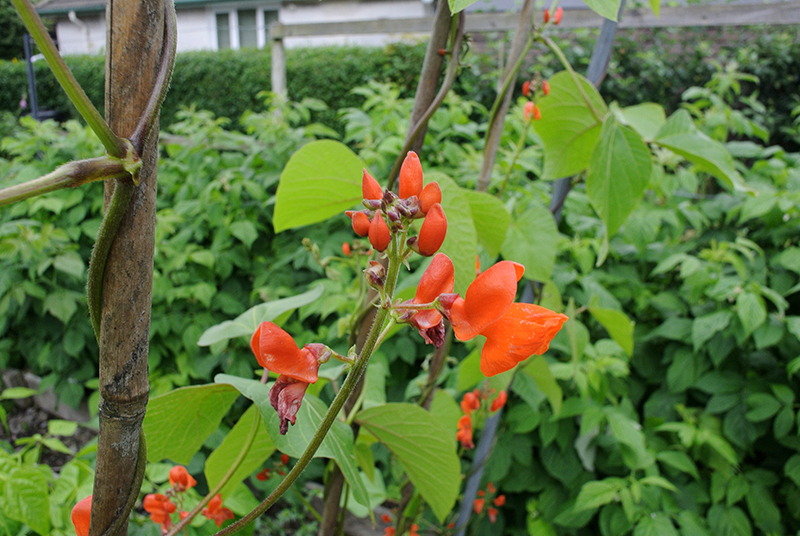 The runner beans are looking more promising by the day. As the weather looked gloomy, Mrs Tootlepedal settled for what she had done and retired inside to watch the ladies Tour de France cycle race up and down the High Street in Paris in heavy rain. We were reminded of how dangerous cycling in the wet can be by the unnervingly frequent sight of these expert bike handlers crashing to the ground while negotiating the corners. During the afternoon it started to rain in Langholm too and I was glad that I had got my little pedal in while it was still dry. 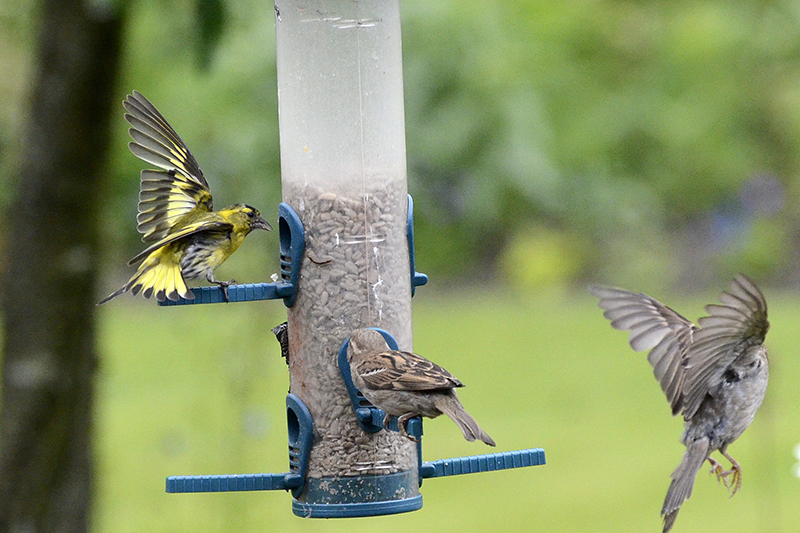 As well as watching the bike racing, I spent some time looking out of the kitchen window. 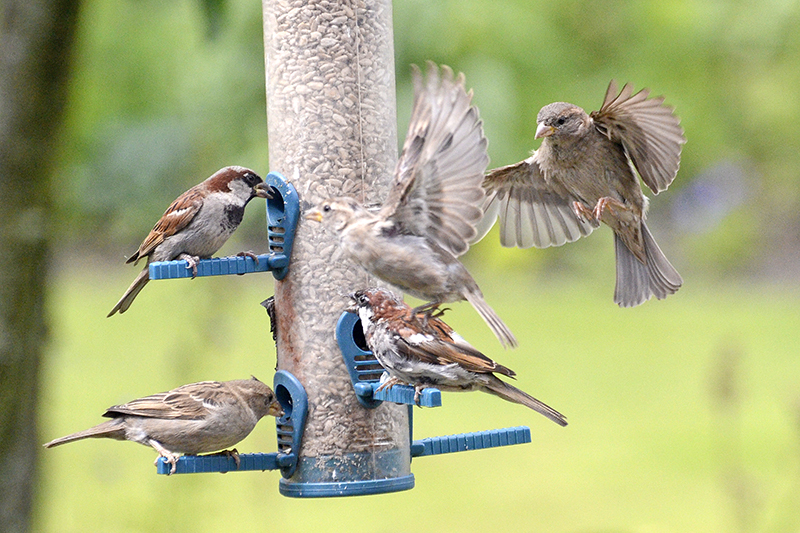 For some reason, the feeder was very busy today and I had to fill it three times. 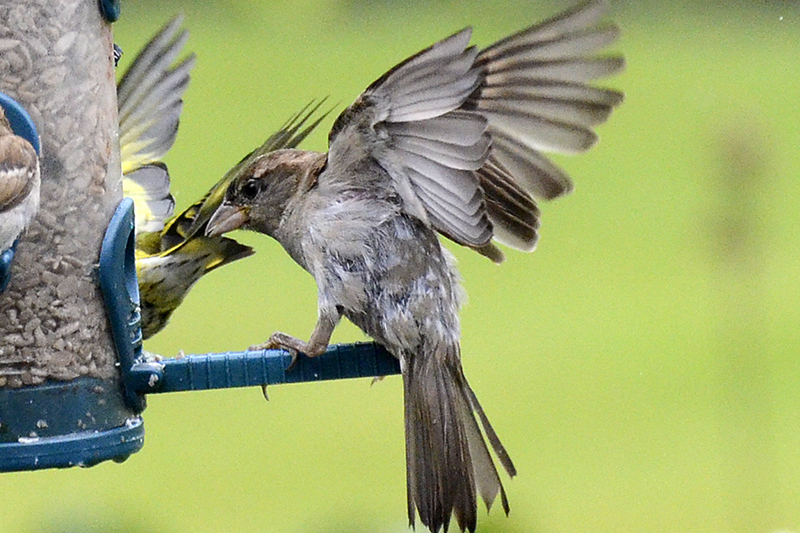 Sparrows were the ones who were doing the most to eat me out of house and home. 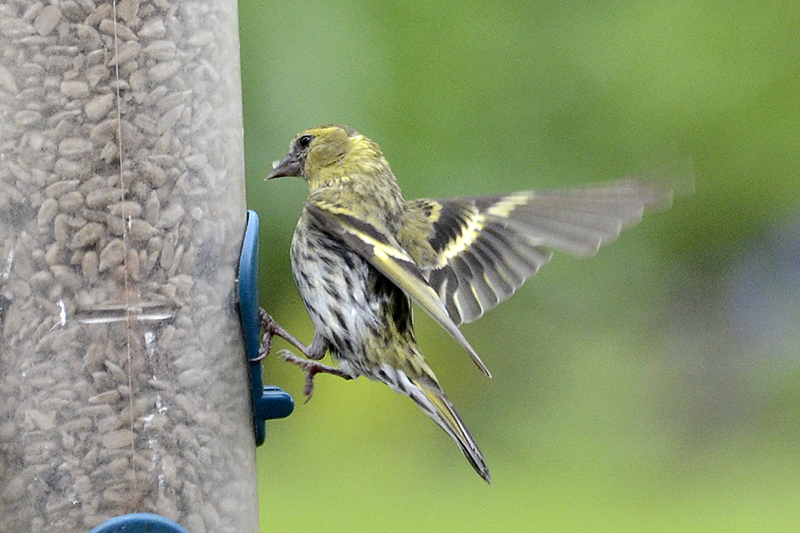 Though there were a few siskins too. 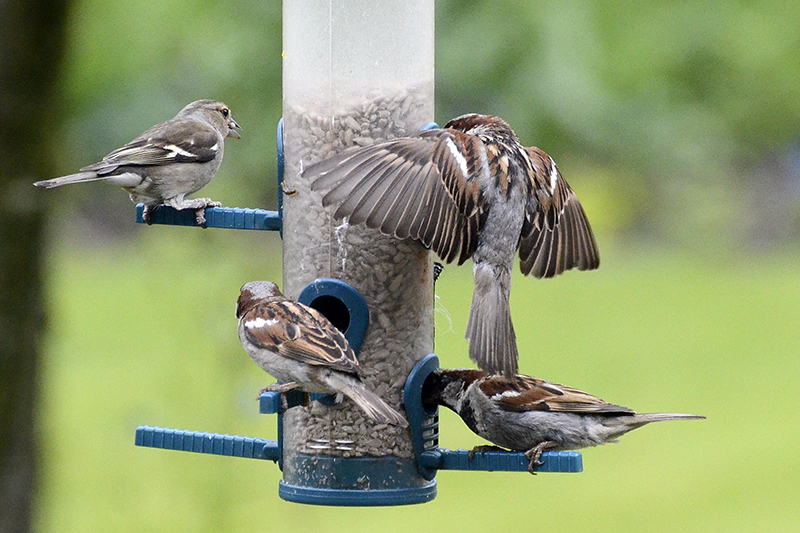 Though it was mostly sparrows. …in all directions at once. We then watched the last stage of the tour and realised that this was the final act of a good set of summer sporting dramas (Wimbledon, The Open Golf, The Tour) which had given us an excuse to sit idly in front of the television set in the afternoons lately and have helped to lessen the gloom that we would otherwise have felt at a miserable spell of weather. We will have to be up and doing from now on. My knee survived the cycling and gardening without getting any worse but it is still sore enough to stop me thinking of a long cycle ride any time soon. My mileage target for the year will have to be severely pruned after a disastrous July. In the evening, I went up to the Archive Centre and retrieved the malfunctioning computer which had spoiled my Thursday night’s work and brought it home, I was able to reinstall the defective Firefox browser from a memory stick and I hope that all will be well now. 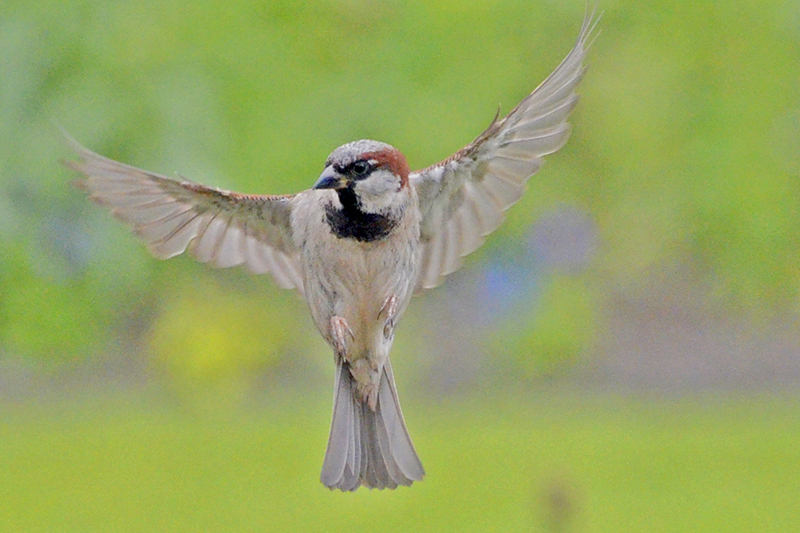 The flying bird of the day was one of the sparrows and the poor light has resulted in a rather arty representation for which I apologise….but I quite like it myself. Today’s guest picture was taken by Venetia on our recent tour with her. 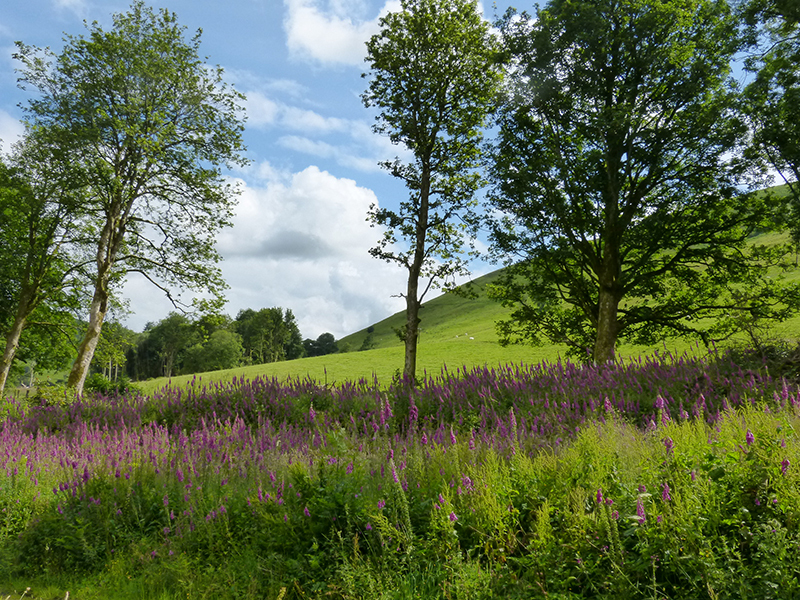 It shows a fine set of foxgloves near Hopsrig. 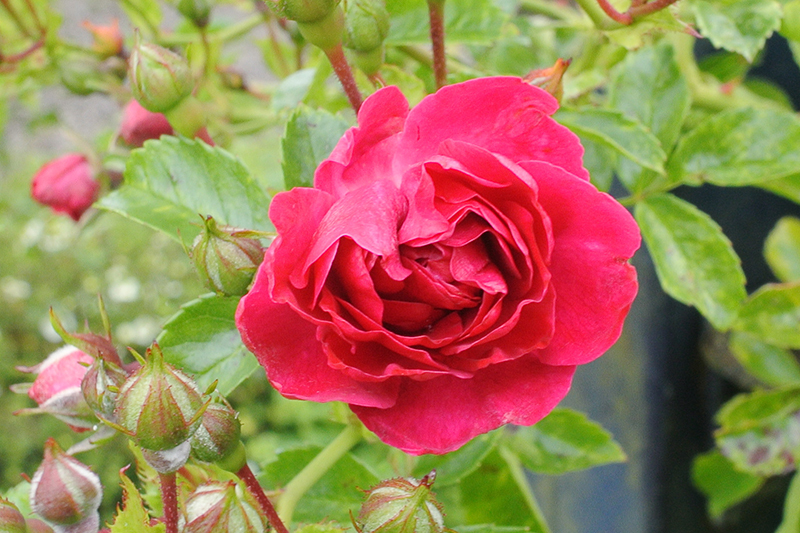 Rather to our surprise, we had a very pleasant morning today and Mrs Tootlepedal made the most of it by working hard in the garden. 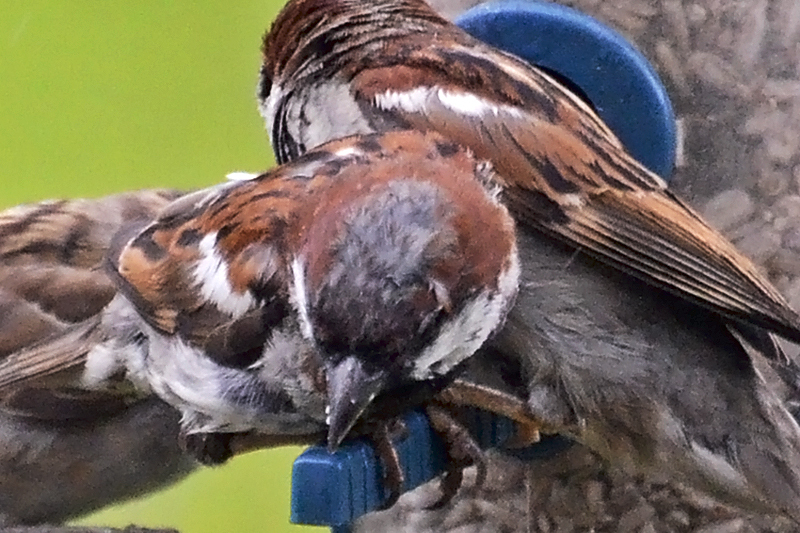 I clipped three more of the box balls…. …leaving just two more to go. 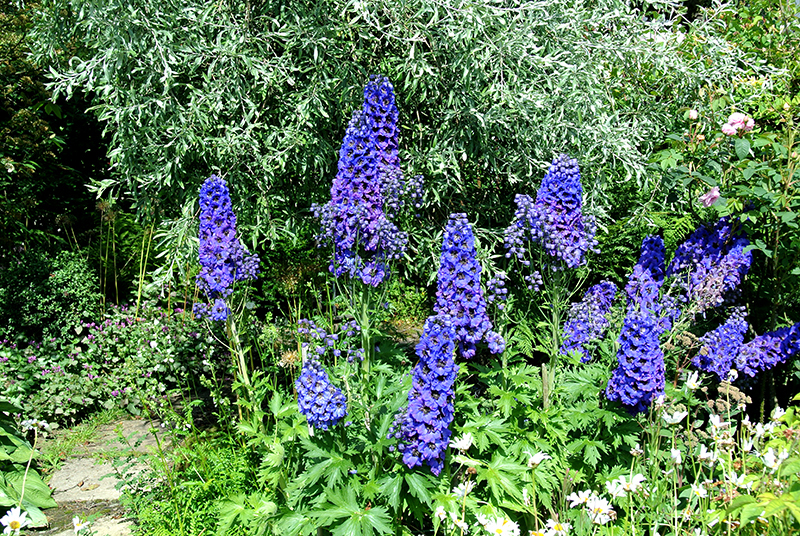 The recent wind and rains have battered the delphiniums so severely that Mrs Tootlepedal is thinking of not growing them again but there are still quite a few standing…..
…and I would be sorry to see them go. 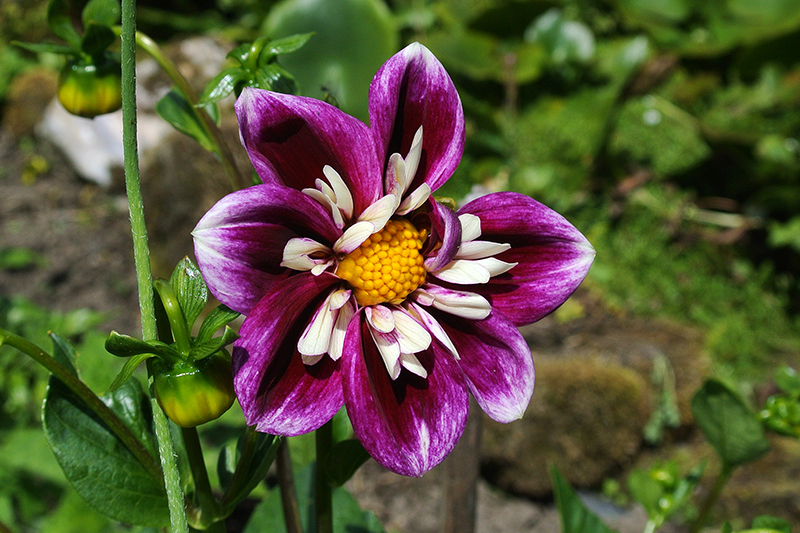 The first dahlia of the year has appeared in all its gaudy glory. Not a shy retiring flower. Our lone gooseberry bush is doing well and both our neighbour Liz and Scott, the minister, dropped by during the day to collect a little of its bounty. 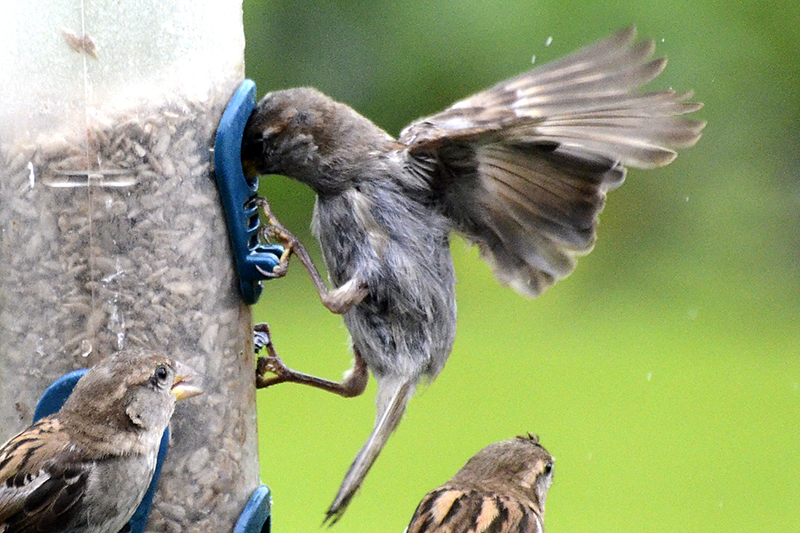 There is still plenty left for me so well has it cropped this year. In the early afternoon, I left Mrs Tootlepedal to keep an eye on the Tour de France for me and went off to the White Yett in the car. 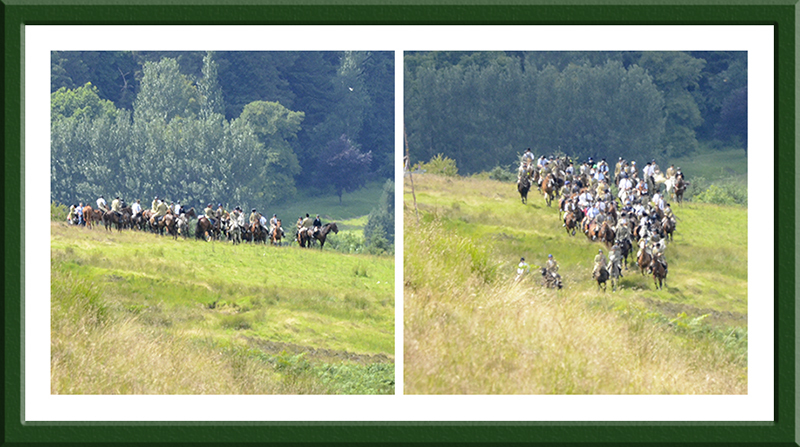 Today was the day of the Castle Craigs ride out and my plan was to take a picture or two to celebrate this event. I left the car and walked up the track towards the monument. There was plenty to see on the way. And the side of the track was lined with thistles. There is no sign of proper heather (calluna vulgaris) yet but there were a few bursts of bell heather (Erica cinerea) beside the path. There was pink all around. 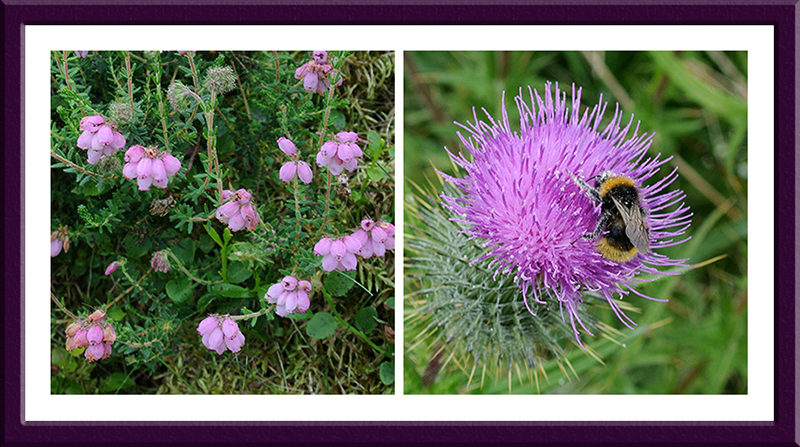 The thistles were busy with bees. 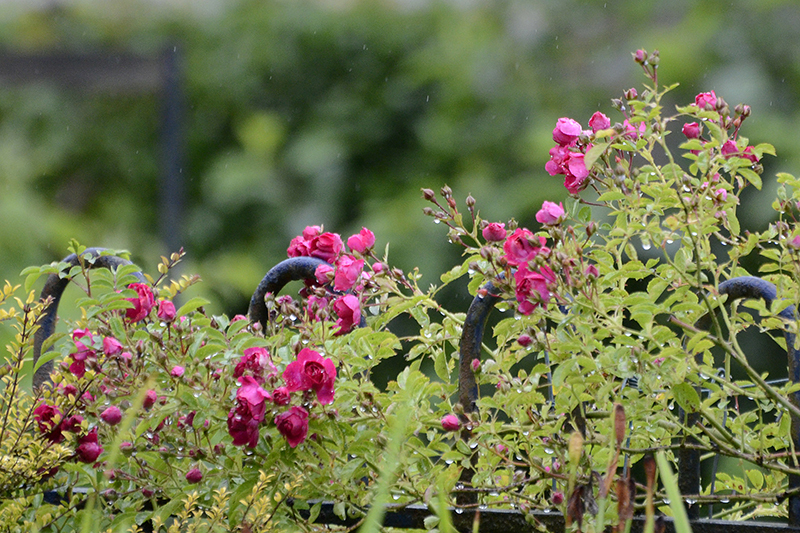 …but luckily for me, standing there coatless in my short sleeves, the rain soon stopped. 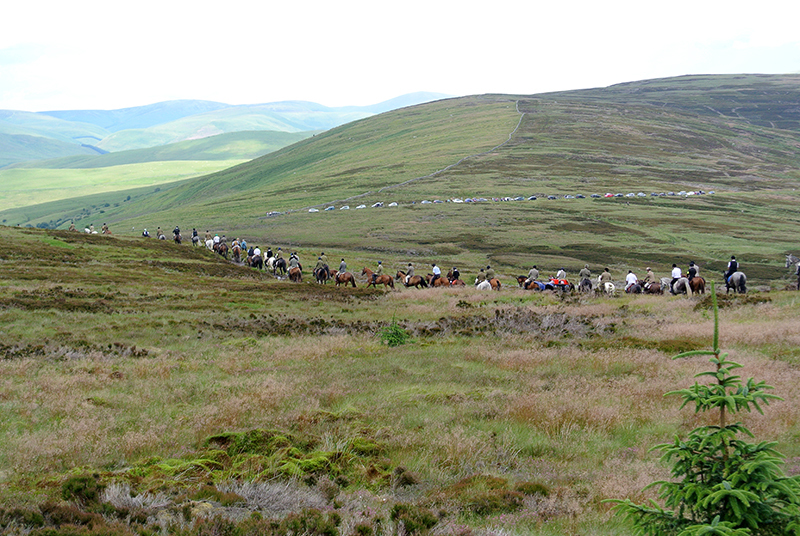 The Castle Craigs ride starts in the Market Square and the riders gallop up the Kirk Wynd before assembling on the hill…. …and then starting the climb up to where I was standing. 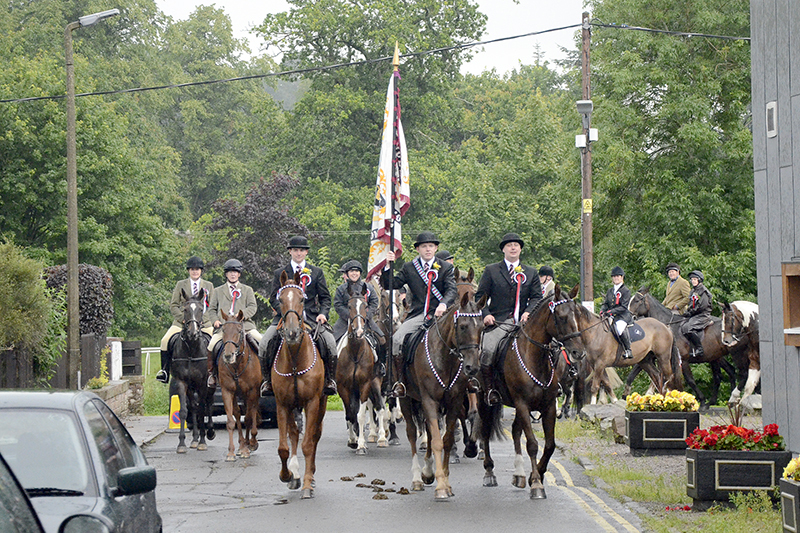 The cornet and his retinue will ride up this track again next Friday, our Common Riding Day, but then he will be carrying the town’s standard. 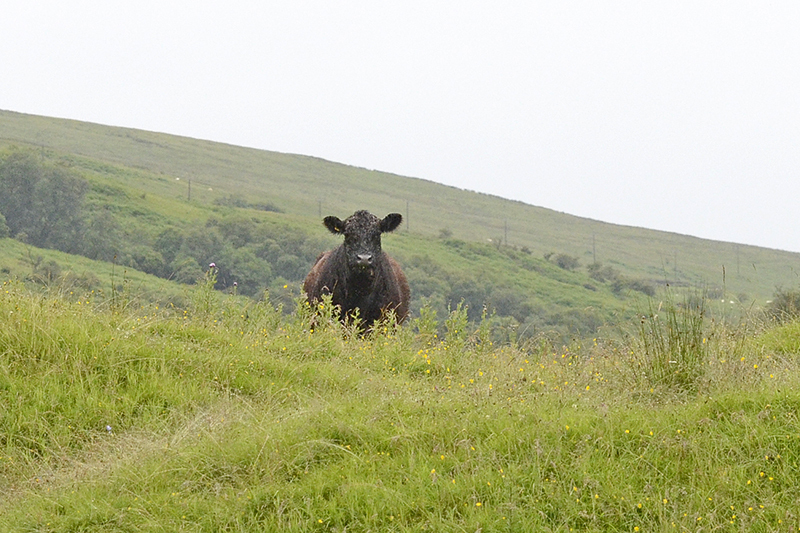 …some, like Andrew, obligingly pausing for the camera…. …before disappearing round the shoulder of the hill. 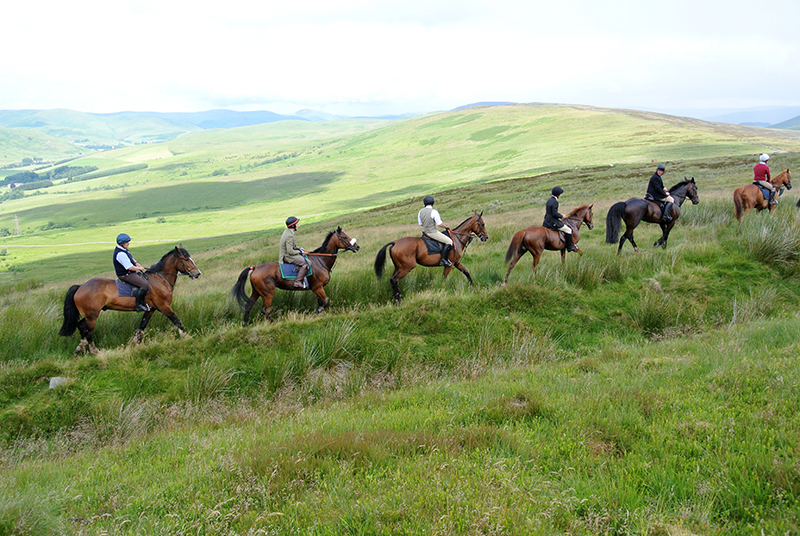 They collect at the Castle Craigs (hence the name of the ride)…. 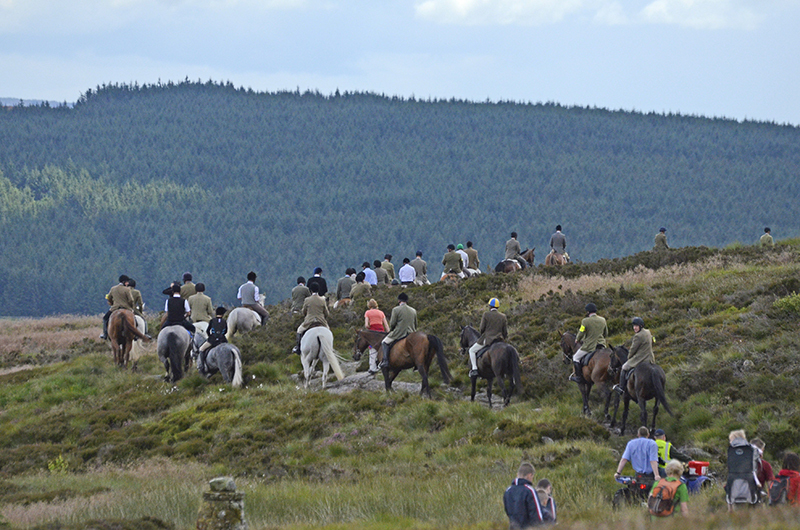 …where they wait for a boys fell race from the Tarras valley below…. 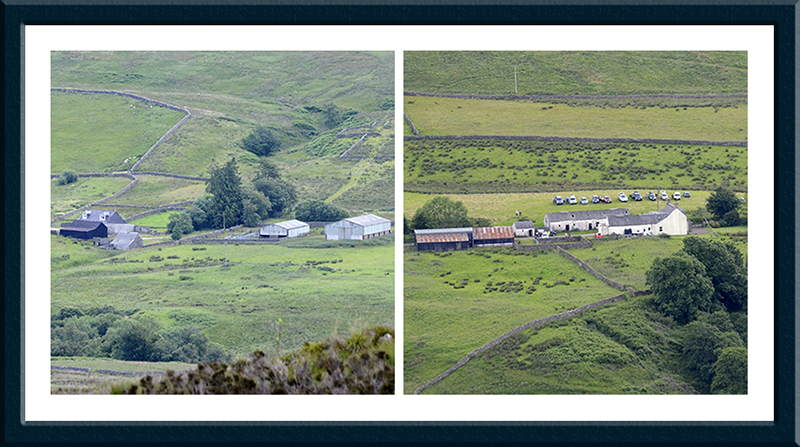 You can see cars parked at Cronksbank where the ride stops for refreshment on its way round the hill. 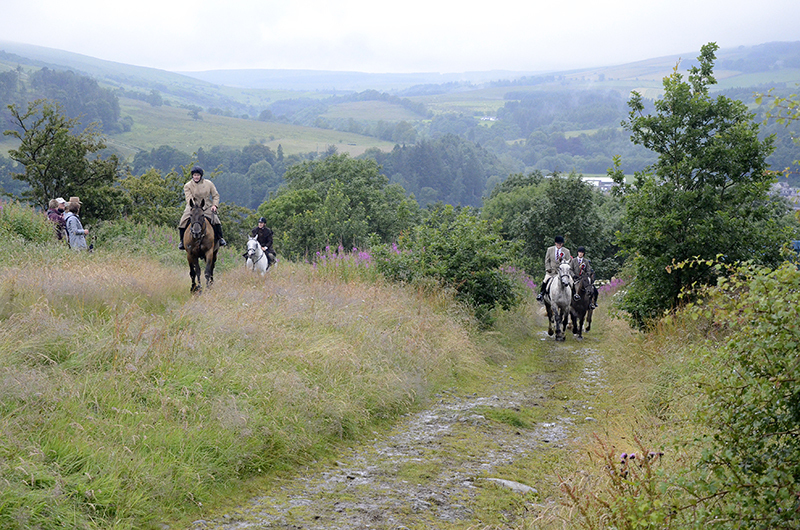 …before setting off back along the track…. 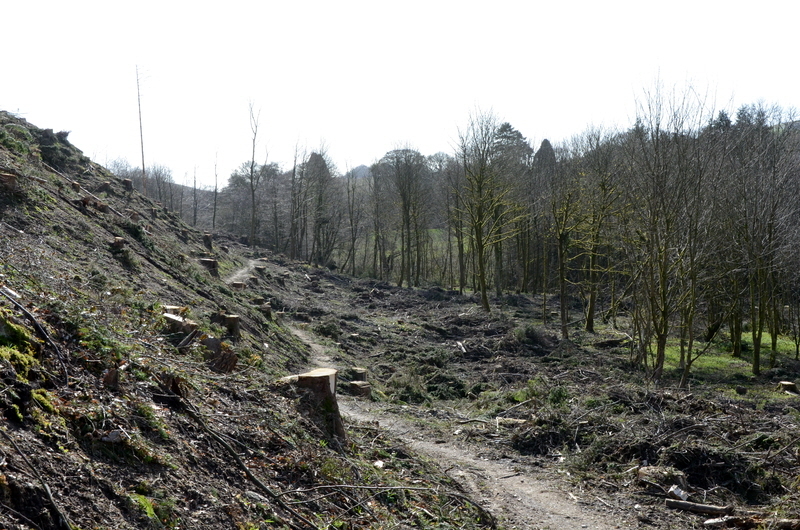 ….and then down the track that I had walked along…. …until they get to the road. 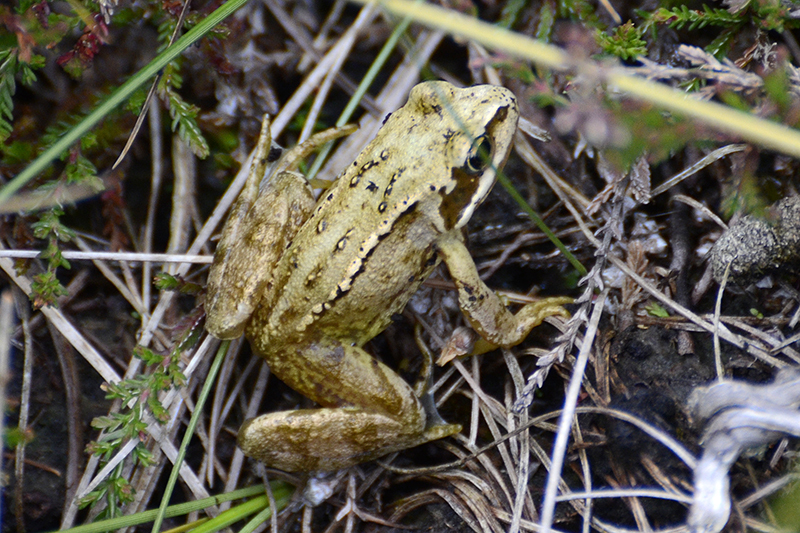 I let them go and walked slowly back to the car stopping to admire a small green frog which Keith Davidson pointed out to me…. It was about the size of my thumb, much smaller than the frogs in our pond. …and the two handsome cairns which mark the track. As the cavalcade continued on its way, I drove home in time to see another exciting stage of the tour come to its conclusion. 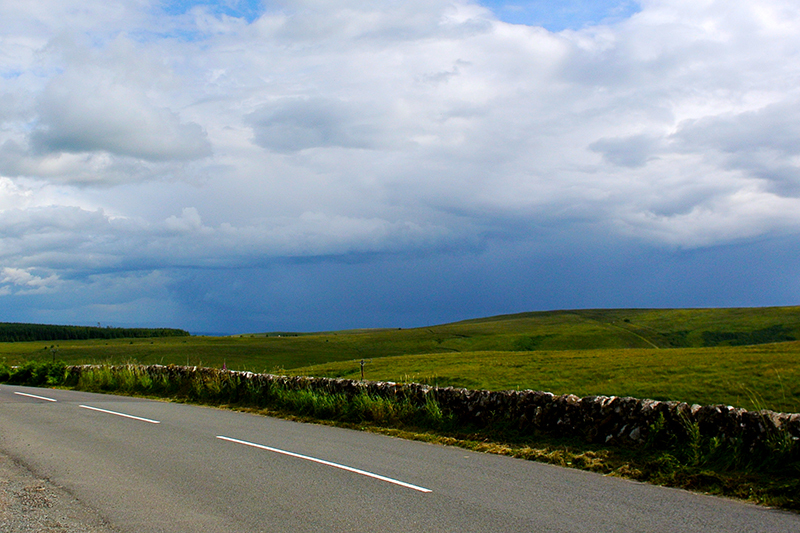 It soon started to rain so I was glad that I had not followed the riders any further. I had thought of another short cycle ride but the combination of walking over some very rough ground following the horses and the intermittent rain persuaded me that this was not a particularly good idea so I didn’t go out. My knee is steadily improving and I hope to give it a good test soon. Later, I dug up three more early potatoes and was pleased to find no slug damage on them at all. Long may this happy state of affairs continue. I picked a few broad beans and had them and some of the potatoes with a lamb stew for my tea. If it doesn’t rain too much tomorrow, I am going to start picking the blackcurrants as I notice that the birds have got ahead of me there and there may not be many left if I delay any longer. 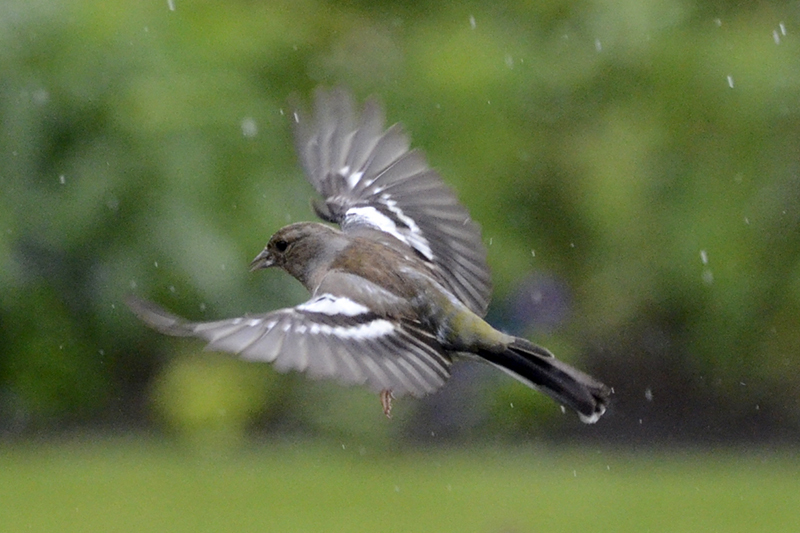 I found a flying chaffinch in the rain.